Congratulations to our recently sworn-in 29 new Court Appointed Special Advocates who completed their 30 hours of training in the month of January! We are so excited to have you on our team and we thank you for your commitment to our organization and community! 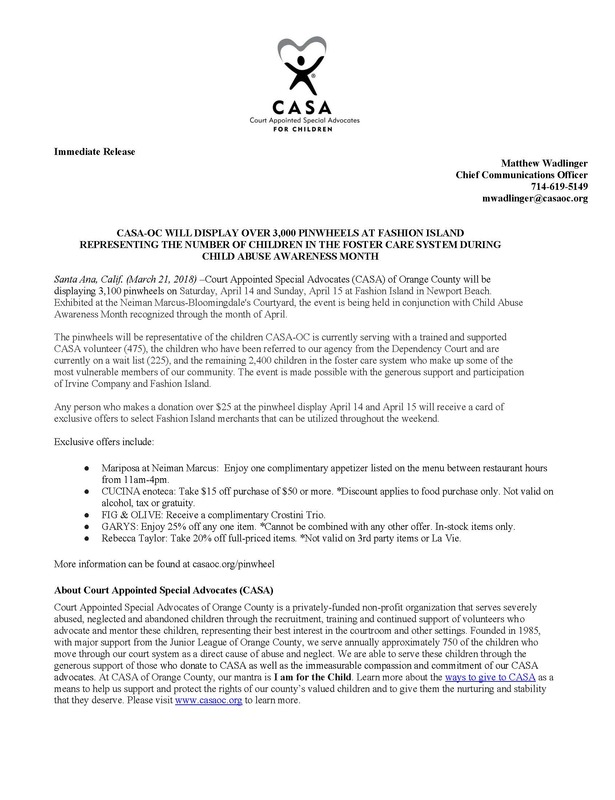 CASA of Orange County is thrilled to make the public announcement of our three chairs for the Friends of CASA Holiday Luncheon happening on Wednesday, December 11th, at the Monarch Beach Resort in Dana Point -- Sandi Marino, Debbie Masek, and Jennifer Gonzales Oxen. Sandi Marino’s years of volunteerism for Orange County non-profits began when she was a member of the PFO board at her children’s elementary school where she was inspired to take on the role of leading community outreach initiatives. These experiences gave her a first-hand view of children living on the streets and living in foster care, which sparked her desire to enhance her philanthropic efforts, specifically her involvement with an organization in which her contributions would help to improve the lives of others, especially children. It was at this time that she was introduced to CASA. Sandi has been a volunteer for the Friends of CASA Holiday Luncheon (FOCASA) for over 12 years, and has served as a chairperson on many committees, specifically as Chair for Entertainment for the last five years. Sandi is the Community Outreach Director on the FOCASA Executive Board of Directors which spearheads all volunteer opportunities for the seventy plus members of the auxiliary group. Sandi is currently completing her degree in interior design at the Interior Design institute in Newport Beach. She recently launched her own interior design company and is already busy designing home interiors in Newport Beach and Corona Del Mar. Prior to being a stay-at-home mother for her two children, Sophia (17) and Enzo (14), she spent several years in corporate America, specializing in sales and marketing at various Fortune 500 companies. She received her Bachelor of Arts degree at Arizona State University in Communications and Broadcast Journalism, where she was also a member of Kappa Alpha Theta sorority. Sandi is originally from Scottsdale, Arizona where her extended family still resides, and has been a resident of Newport Beach for over 25 years. She loves to spend her time with her children and friends, and enjoys cooking, traveling, hiking, skiing, and playing tennis. Debbie Masek has a long history of non-profit experience and philanthropic volunteer work in Orange County dating back to 2002. She volunteered with The Junior League of Orange County from 2002 to 2016 and was heavily involved in their biggest fundraiser, The Christmas Company, where she held various Executive positions. Debbie has also taken leadership roles on her son’s PTA Board. Most recently, Debbie has pursued her passion for helping children through her volunteer work with Court Appointed Special Advocates (CASA) of Orange County. 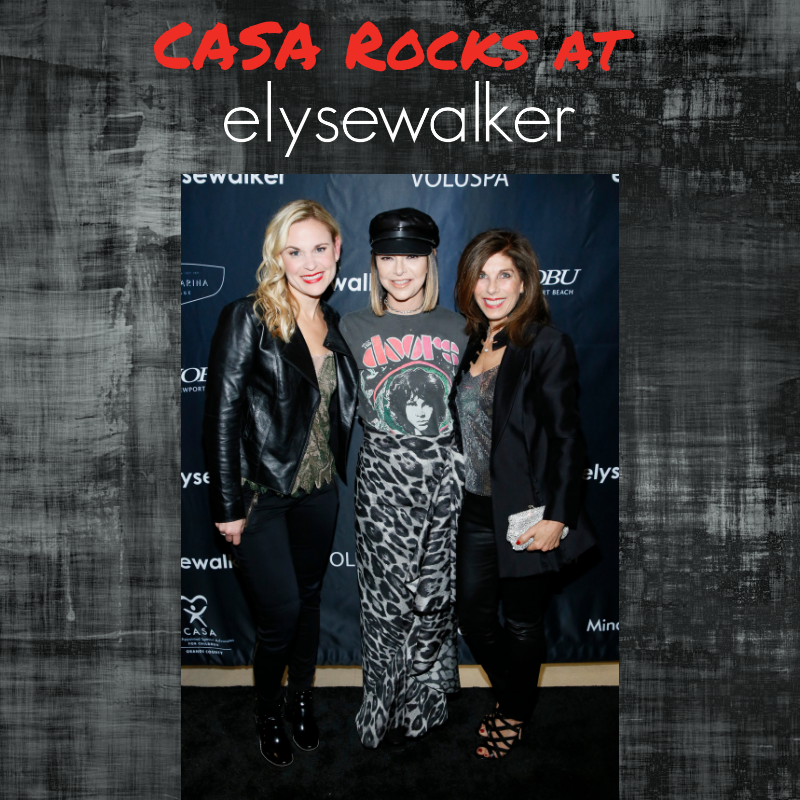 CASA is a local nonprofit that recruits, trains and supervises community volunteers working one-on-one with a youth in the foster care system. Debbie currently serves on the Friends of CASA (FOCASA) Board as Communications Director where she is responsible for overseeing the monthly FOCASA newsletter as well as keeping the FOCASA Board and all FOCASA members apprised of information pertaining to the CASA organization. Debbie also most recently served as Public Relations Committee Chair for the 2018 Friends of CASA Holiday Luncheon. In the past, Debbie has served on various Committees for the FOCASA Holiday Luncheon including the Silent Auction, Operations, and Starfish Wishes. She continues to support her community as a 2017-2018 PTSA Board Member for El Rancho Charter School. Debbie resides in Orange with her husband of 16 years, Joe, and their son, Chase, age 13. She spends her free time enjoying outdoor activities, traveling, and experiencing local restaurants with friends and family. Jennifer Gonzales Oxen has been involved with the Friends of CASA Holiday Luncheon for the past several years. Although fairly new to the Holiday Luncheon, Jennifer has been an active volunteer in the Orange County community since moving to Orange County from Texas. Jennifer began volunteering with the Junior League of Orange County in 2007 and was actively involved in the organizations largest fundraiser, The Christmas Company, for many years. She continues to serve as a Junior League Sustaining Member. Because Jennifer is passionate about supporting causes tied to our local youth, she is particularly dedicated to supporting the CASA mission. Jennifer graduated with a Bachelor’s Degree in Communications from the University of Texas at Austin and relocated to California to begin her career in employee benefit solutions. She serves as a sales consultant for Warner Pacific Insurance Services, offering expertise in medical and ancillary insurance needs, as well as employee benefit technology solutions. Outside of professional and volunteer commitments, Jennifer enjoys time with friends and family, distance running, and travel. Jennifer and her husband, Randy, reside in Fullerton with their young son Jake. 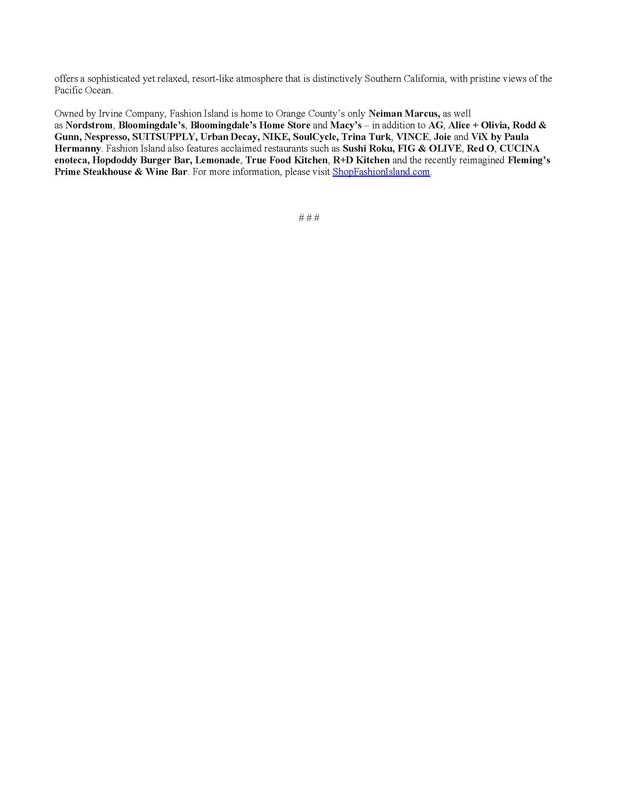 Santa Ana, Calif. (February 19, 2019) – Court Appointed Special Advocates (CASA) of Orange County is pleased to announce the appointment of Linda Zamora as the new Chair to the Diversity Committee auxiliary group. The CASA Diversity Committee was formerly known as the Hispanic Advisory Council, and changed its name to the Diversity Committee in January of 2018. 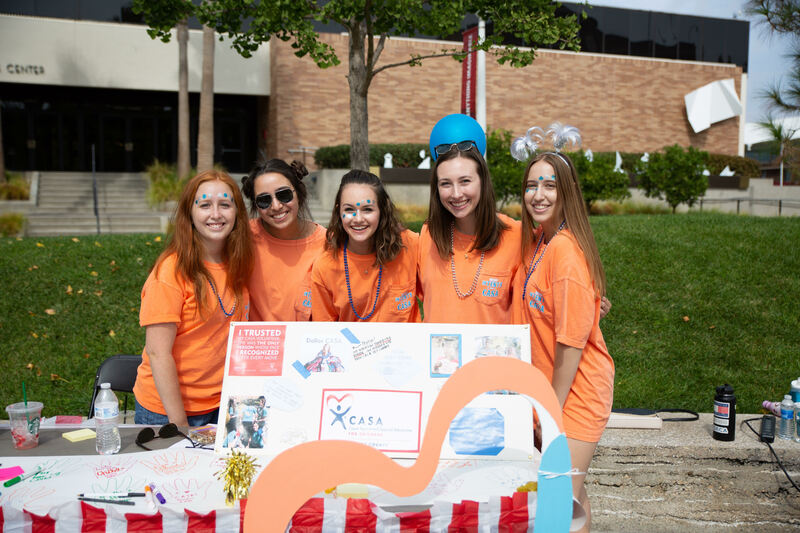 The Diversity Committee supports CASA’s mission by actively spreading community awareness in order to grow a diverse pool of volunteers – with the primary goal of recruiting and retaining advocates that mirror the demographics of the children CASA serves. 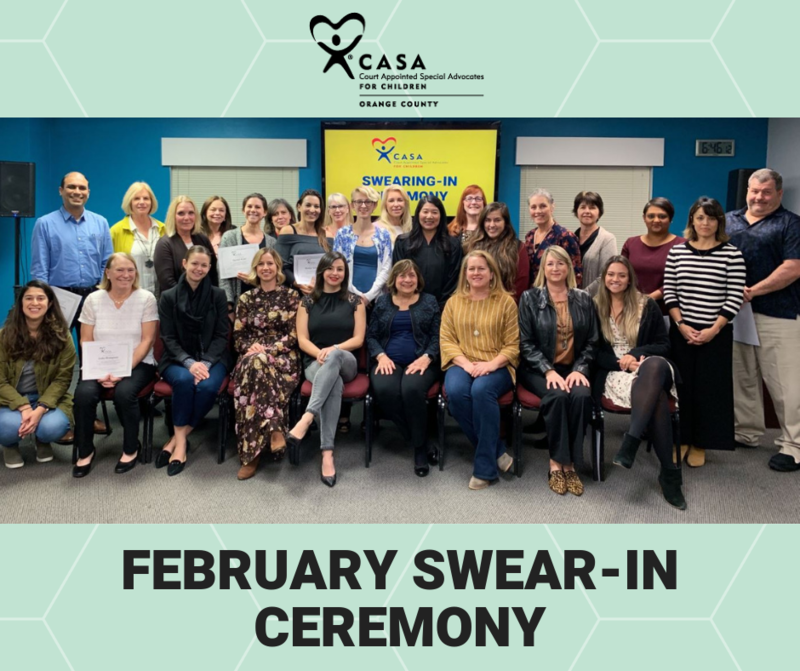 CASA currently has 486 community volunteers who have taken 30 hours of mandated training provided by the organization and have taken sworn oaths of confidentiality to officially become Court Appointed Special Advocates. Currently, the two areas of primary focus for the Diversity Committee are increasing the number of prospective individuals who identify as Hispanic/Latino(which account for 13% of the volunteers CASA has and 60% of the children served) and male individuals (which account for 19% of the volunteers CASA has and 49% of the children served). The Diversity Committee is comprised of engaged community members who assist in the efforts of finding unique avenues to assist in the volunteer recruitment efforts of the CASA organization. 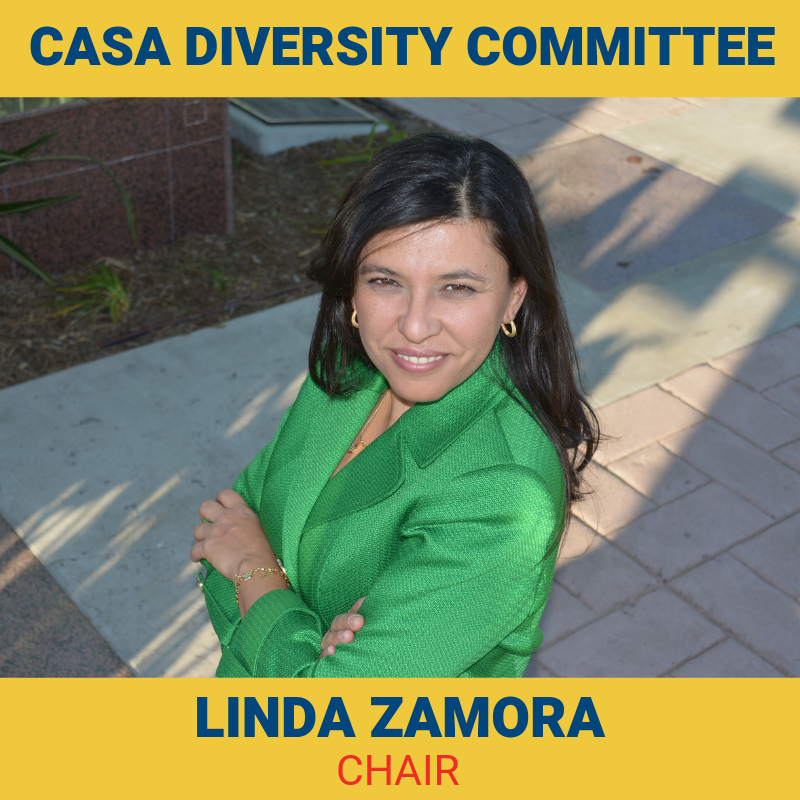 CASA is honored to have Linda Zamora at the helm of the Diversity Committee. Linda has been an active member of this group since 2015. “I am looking forward to leading the CASA Diversity Committee as we develop both short-term and long-term strategies to help us meet our goals of recruiting more volunteers to work one-on-one with a child in the foster care system. The work that CASA does is critical to ensuring these vulnerable youth have a chance at a normal childhood and breaking the cycle of abuse and neglect that has been in many of their families for generations.. Knowing that CASA currently has a wait list of over 250 youth who need a CASA volunteer to mentor them and advocate on their behalf in an overburdened and underfunded system is the reason that I am passionate about this organization and leading the Diversity Committee”, said Zamora. Linda Zamora has lived in Garden Grove since 2002. She was born in Ventura and grew up in Mexico. She moved back to the USA as a teenager. Linda earned a Bachelor’s degree in Spanish Literature & Culture and a minor in Latino Health Administration from California State University Long Beach. After CSULB, she attended interpreting school and obtained her state certification as a court interpreter. Linda started her own interpreting and translation business in 2011 providing services in most languages spoken in California. Before becoming a business owner, she worked for Kaiser Permanente for close to 15 years in the Sales & Marketing department. She is an active Garden Grove community member. She served on the Garden Grove Planning Commission from 2013-2017, the Neighborhood Improvement Commission 2006-2010. She is now a board member of the Garden Grove Chamber of Commerce and Co-Chair its Government Affairs Committee. To add more meaning to her life, she loves spending time with her two dogs, reading, cooking, hiking, visiting museums and recently learning about Stoicism a philosophy that grounds her and brings her serenity. Court Appointed Special Advocates of Orange County is a privately-funded non-profit organization that serves severely abused, neglected and abandoned children through the recruitment, training and continued support of volunteers who advocate and mentor these children, representing their best interest in the courtroom and other settings. Founded in 1985, with major support from the Junior League of Orange County, CASA serves approximately 700 of the children who move through the dependency court system due to being victims of abuse and neglect. We are able to serve these children through the generous support of those who donate to CASA as well as the immeasurable compassion and commitment of our CASA advocates. At CASA of Orange County, our mantra is I am for the Child. Learn more about the ways to give to CASA as a means to help us support and protect the rights of our county’s most vulnerable children and to give them the nurturing and stability that they deserve. Please visit casaoc.org to learn more. 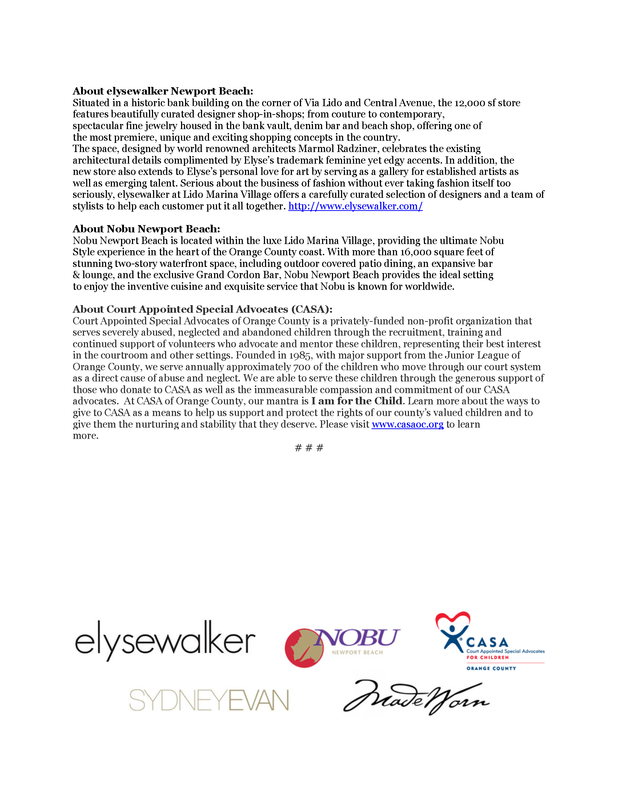 CASA of Orange County is incredibly proud to present our new partnership with Luminous Smiles of Newport Beach. Dr. Desai has graciously offered the services at her dentistry for youth in the foster care system and that are matched up with a CASA volunteer. Lizbeth, who is a non-minor dependent, was the first youth in our program to benefit from this extremely kind and generous offer. Her confidence has been lifted through the amazing work that Luminous Smiles has provided by fixing Lizbeth's smile through a dental restoration. 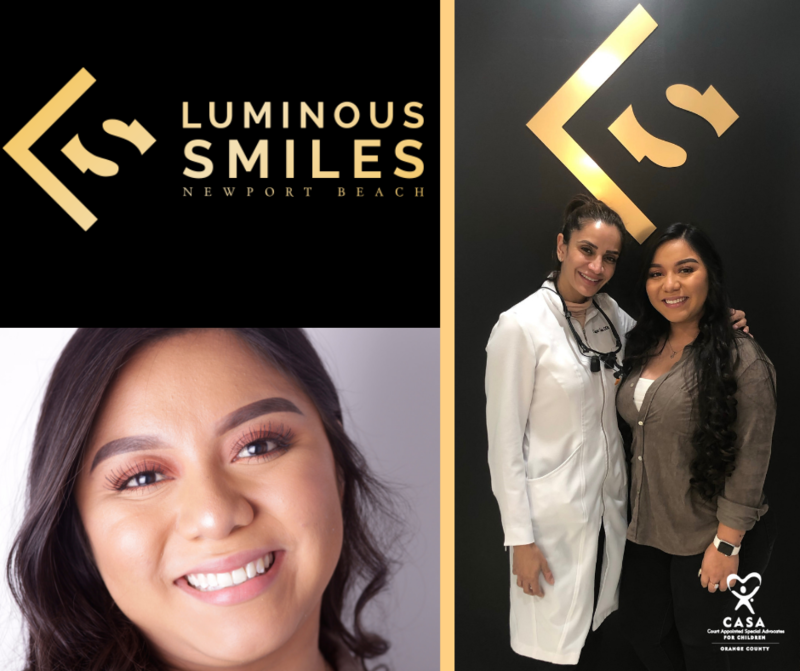 We thank Dr. Desai and the entire team at Luminous Smiles for their commitment to helping others in our own community. CASA of Orange County is proud to show off our Annual Report for the fiscal year of October 1st, 2017 through September 30th, 2018! Congratulations to our newly sworn-in 31 Court Appointed Special Advocates. 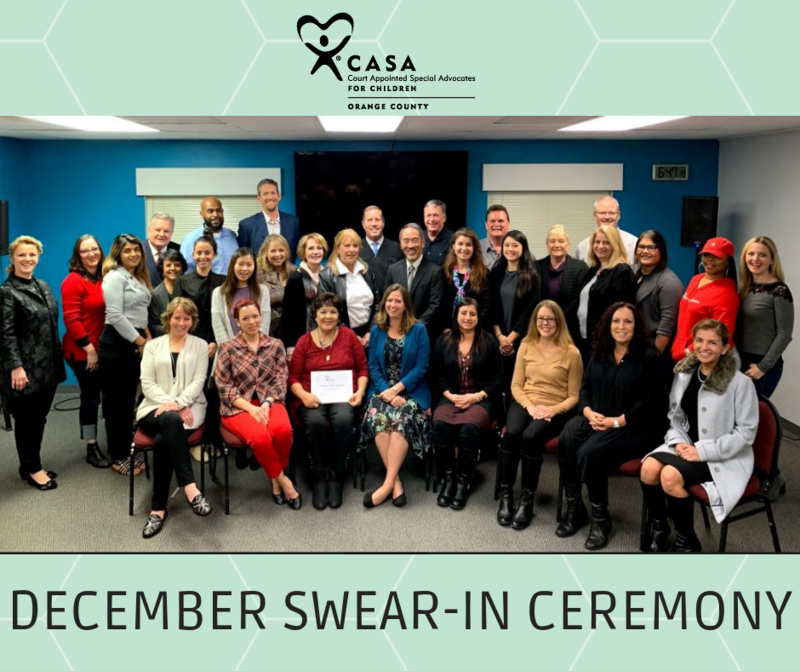 Thank you to our friend, Judge Arthur, who was able to come into the CASA offices on December 18th, 2018, to oversee the well attended swear-in ceremony for these special new volunteers! 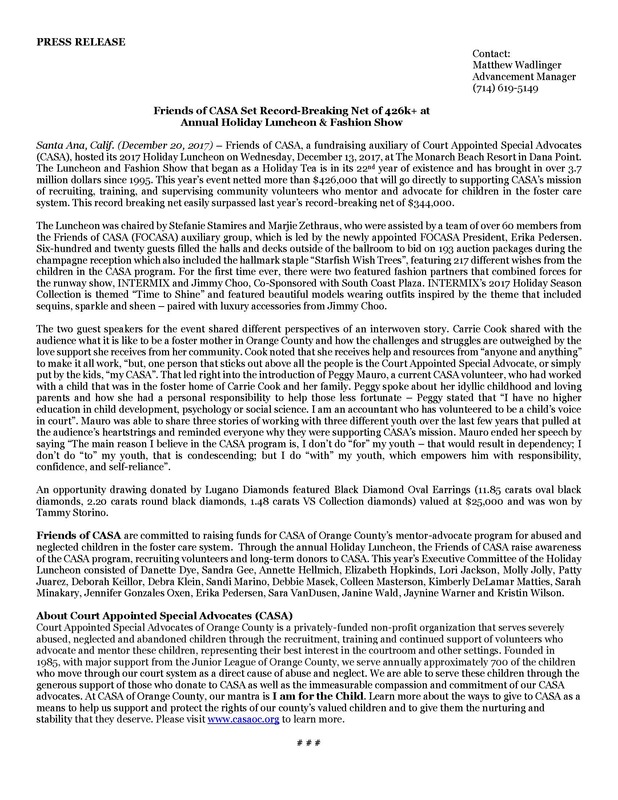 Santa Ana, Calif. (December 19, 2018) – Friends of CASA, a fundraising auxiliary of Court Appointed Special Advocates (CASA), hosted its 2018 Holiday Luncheon on Thursday, December 13, at The Monarch Beach Resort in Dana Point. The Luncheon and Fashion Show that began as a Holiday Tea is in its 23nd year of existence and has brought in over 4 million dollars since 1995. This year’s Luncheon had a record breaking net for the fifth year in a row – with more than $452,000 that will go directly to supporting CASA’s mission of recruiting, training, and supervising community volunteers who mentor and advocate for children in the foster care system. The Luncheon was chaired by Melissa Rohani and Michelle Fisher, who were assisted by a team of over 85 members from the Friends of CASA (FOCASA) auxiliary group, which is led by the newly appointed FOCASA President, Lori Jackson. Five hundred and thirty guests filled the halls and decks outside of the ballroom to bid on 200 auction packages during the champagne reception. Guests were able to fulfill a foster child’s wish through ornaments placed on the “Starfish Wish Trees”, featuring 202 different wishes from the children in the CASA program which included items like dance classes, summer camp and a laptop computer for a college bound young adult. For the second year in a row the trees were sponsored and beautifully decorated by Barclay Butera Interiors. The ballroom at the Monarch Beach Resort was beautifully decorated and styled by Elite OC Productions. Tory Burch created an immersive experience, down to the Tory Burch designed table cloths and napkins. This year’s fashion presentation by Tory Burch and South Coast Plaza featured Celebrity Fashion Stylist, Brad Goreski, on stage to help present the collections. Tory Burch showed 20 beautiful looks from the Resort 2019 collection, as well as the Spring/Summer 2019 Tory Sport collection. This year’s keynote speaker was the 2017-2018 Miss Outstanding Teen Arizona, Dimon Sanders. Dimon shared her story of entering the foster care system in June of 2009 due to abuse by her biological father and neglect by her biological mother. “Over the course of my 5 years in the foster care system, I had 2 attorneys, 5 behavioral health specialists, 5 therapists, 5 case managers, attended 5 schools and lived in 13 different foster care placements. That’s a total of 35 people who came in and out of my life. My source of consistency was person number 36, my CASA”. Ms. Sanders proudly shared with the crowd that she was adopted out of the foster care system with the help of her Court Appointed Special Advocate and has since graduated college. An opportunity drawing donated by Lugano Diamonds was a Diamond Bangle featuring 3.69cts Round Brilliant Collection VS Diamonds set in 18K White Gold which values for $20,000, was won by CASA Board of Directors Member, Susan Leibel. 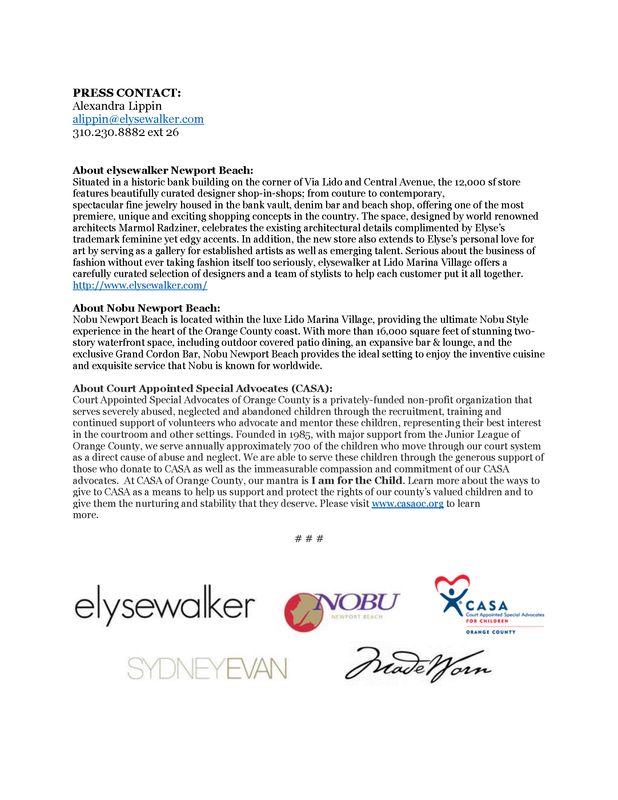 Diamond Starfish Sponsors for this event include the Official Jewelry Sponsor, Lugano Diamonds, and Shiva Ommi. Ruby Starfish Sponsors are Michelle and David Fisher as well as Melissa and Parsa Rohani. 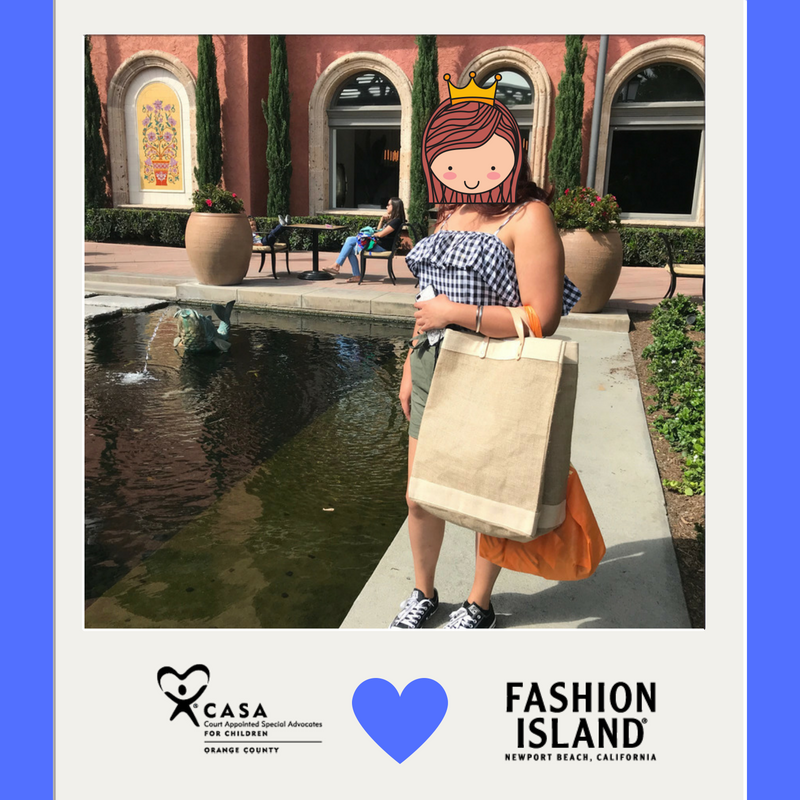 Friends of CASA are committed to raising funds for CASA of Orange County’s mentor-advocate program for abused and neglected children in the foster care system. Through the annual Holiday Luncheon, the Friends of CASA raise awareness of the CASA program, recruiting volunteers and long-term donors to CASA. This year’s Executive Committee of the Holiday Luncheon was comprised by the following Friends of CASA members: Kimberly DeLamar Matties, Jennifer Gonzales Oxen, Jennifer Hanlon, Debra Klein-Sanner, Lori Jackson, Joanna James, Molly Jolly, Patty Juarez, Mei Li, Sandi Marino, Debbie Masek, Colleen Masterson, Sarah Minakary, Stefanie Stamires, Janine Wald and Marjie Zethraus. Court Appointed Special Advocates of Orange County is a privately-funded non-profit organization that serves severely abused, neglected and abandoned children through the recruitment, training and continued support of volunteers who advocate and mentor these children, representing their best interest in the courtroom and other settings. Founded in 1985, with major support from the Junior League of Orange County, CASA serves approximately 700 of the children who move through the dependency court system due to being victims of abuse and neglect. We are able to serve these children through the generous support of those who donate to CASA as well as the immeasurable compassion and commitment of our CASA advocates. At CASA of Orange County, our mantra is I am for the Child. Learn more about the ways to give to CASA as a means to help us support and protect the rights of our county’s most volunerable children and to give them the nurturing and stability that they deserve. Please visit casaoc.org to learn more. 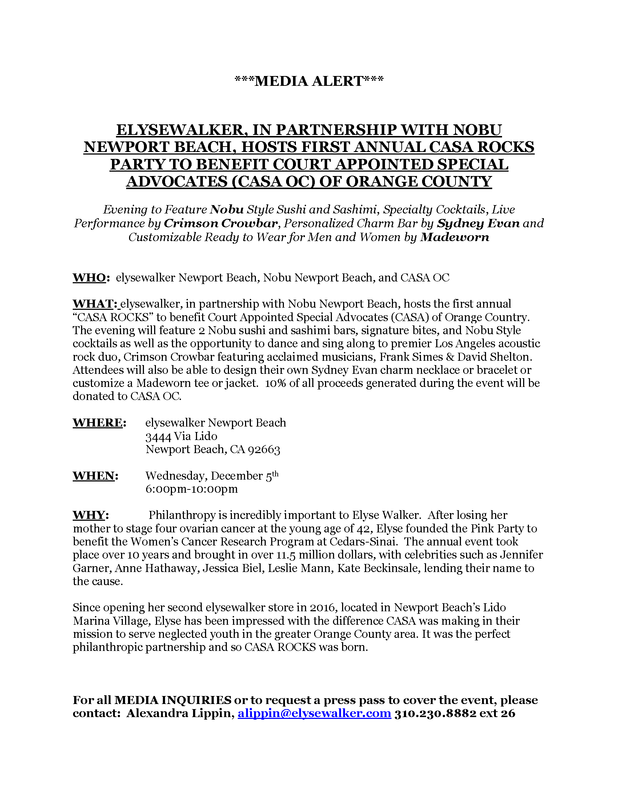 Thank you to Paul Porter from Elev8 Industries for helping to coordinate this great video featuring CASA-OC. Garth "Worm" Wyckoff put the spotlight on CASA-OC through an interview on his show "180 with Worm" with CASA-OC Chief Communications Officer, Matthew Wadlinger. Check out his Instagram page at @lagunaworm to see more! Congratulations to our newly sworn-in group of 36 Court Appointed Special Advocates who recently completed their 30 hours of training during the September 2018 Training Session. We are so unbelievably proud of these new volunteers and excited for them to begin work on their first child assignment! 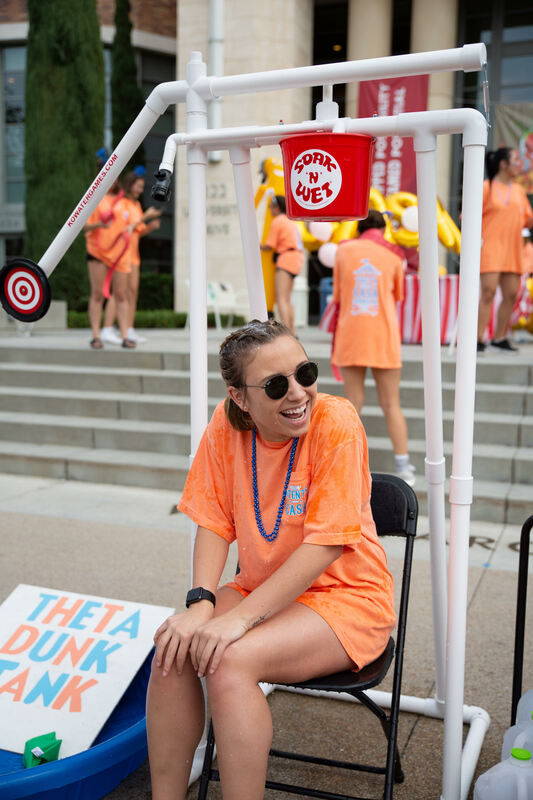 CASA of Orange County would like to highlight and give thanks to our amazing community partners at Kappa Alpha Theta from Chapman University for the amazing success that they had at their CASA Carnival Fundraiser. 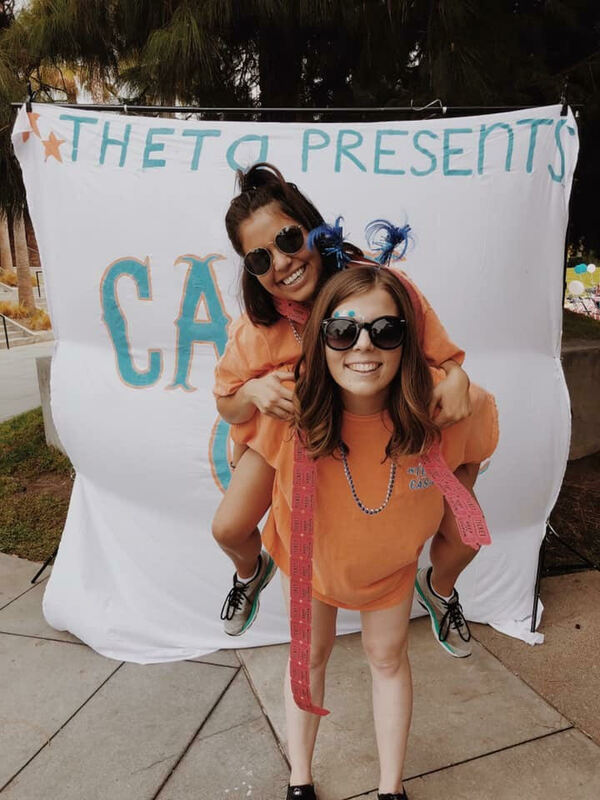 These young women were able to plan, organize and execute their own fundraiser and raised an astonishing $18,000 for CASA-OC! CASA-OC is proud to show off our 20 newly sworn-in Court Appointed Special Advocates that finished their 30 hours of training in July and got sworn-in on August 28th! CASA is so proud of our 24 recently sworn-in advocates who just finished up with their 30 hours of training to become Court Appointed Special Advocates. On Tuesday evening Judge Arthur was able come to the CASA offices and make it all official in front of 90 guests in attendance. 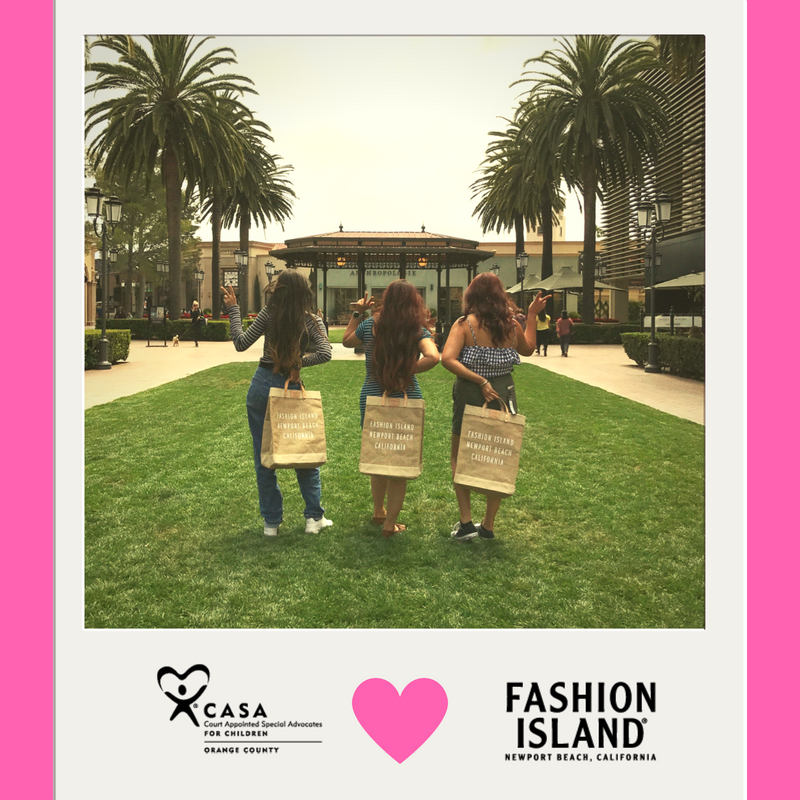 CASA of Orange County would like to thank Fashion Island in Newport Beach for hosting a special day for three outstanding youth in the foster care system. 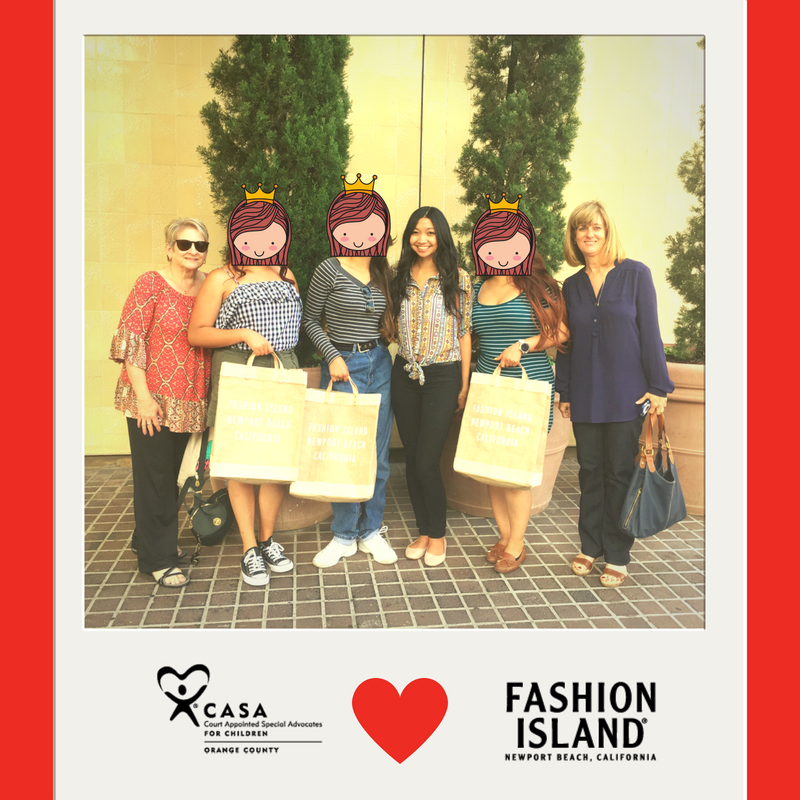 Three young women (two of which just graduated high school and one who recently finished her first year of college) and their CASA volunteers got to have a fantastic experience at Fashion Island. The day started with receiving a beautiful tote bag, and then continued on to Drybar, where all 6 women got their hair blown out and styled. Following that first experience, Happy Nails & Spa graciously gave beautiful manicures and pedicures. Lunch came courtesy of Bloomingdale's 59th & Lex patio, where the ladies got to sit outside and enjoy a beautiful meal. After lunch the three young women got to end their trip with a mini shopping spree at Forever 21 and Urban Outfitters. 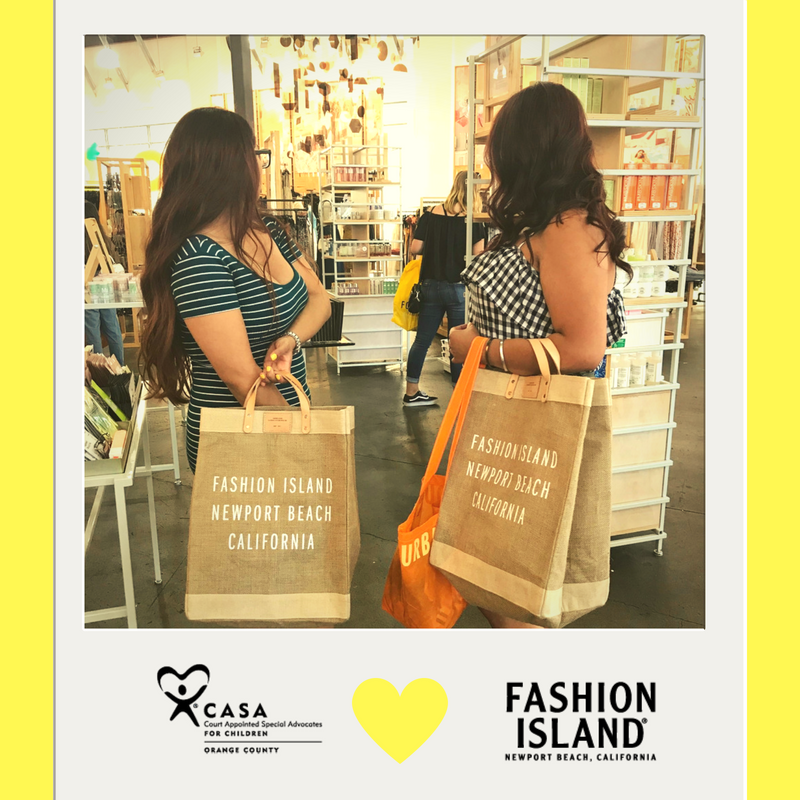 CASA is so appreciative to Fashion Island for creating this opportunity for these amazing young adults in our program and their three CASA volunteers. We would like to give a special thank you and shout out to Melissa Robles, Courtney Toney and Veronica Salgado Rico - for coordinating the special details that made this such a memorable experience. May 14th is officially CASA Appreciation Day! 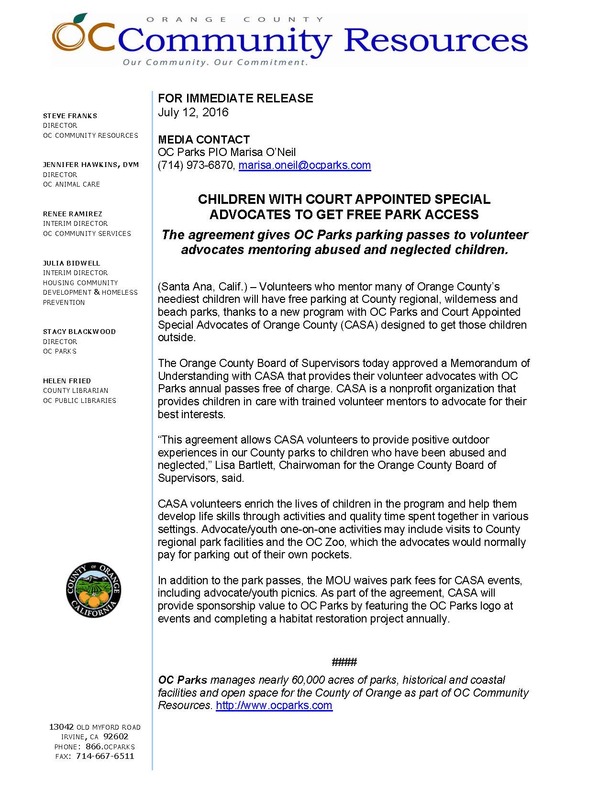 CASA of Orange County was fortunate enough to spearhead a joint effort with California State Senator, Josh Newman. Newman introduced SCR 131 on the senate floor that declares May 14th as CASA Appreciation Day in the state of California. Senator Newman and his wife Darcy Lewis are both former CASA volunteers from Orange County and have been major supporters of our organization. CASA was lucky enough to send some of our team up to the Capitol Building in Sacramento for this special recognition ceremony -- Regan Phillips (CASA-OC CEO), Andy Jacobson (CASA Case Supervisor), Pat Cahill (longest serving CASA-OC volunteer - over 22 years! ), Lily Colby (California CASA Policy & Program Coordinator), Jaynine Warner (CASA Board Member & former Friends of CASA President). 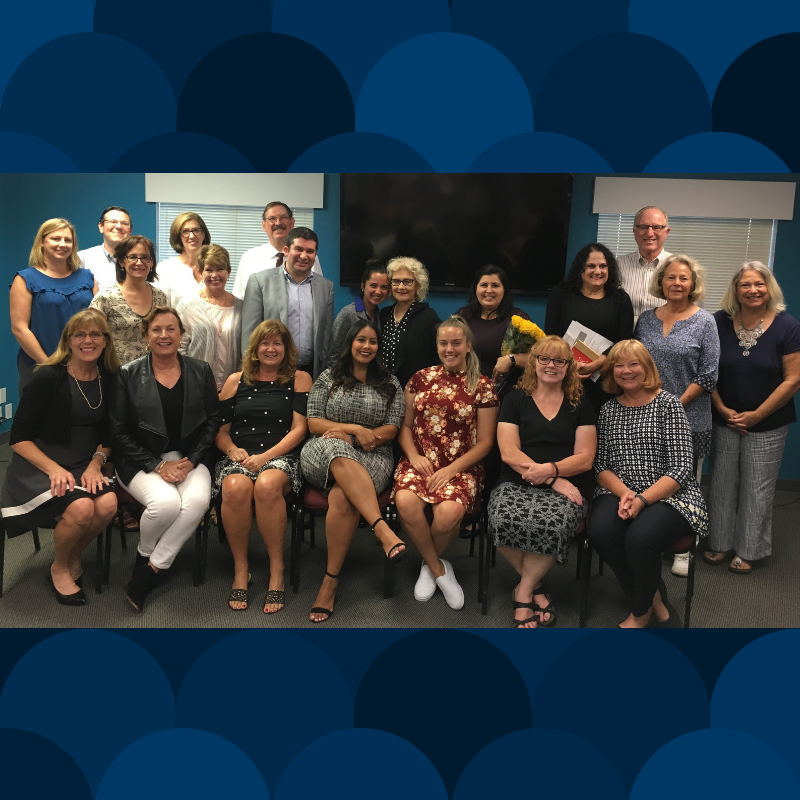 Please join us in welcoming our 18 newly trained Court Appointed Special Advocates who will be joining our team of amazing volunteers who mentor and advocate for children in the OC Foster Care system! You can also check out a little video that chronicles their training session of 30 hours that took place in March! CASA is so proud of our amazing new 11 volunteer advocates who are getting to work on their new case assignments! Check out this little video that chronicles their training classes! CASA of Orange County is proud to showcase some of the many highlights from our last fiscal year (October 1st, 2016 - September 20th, 2017) in our newest Annual Report! Check it all out at this link! Special recognition to Rogue Creative Development for the design, Classic Kids Photography in Newport Beach for providing all the photographs, the Kiersby Family for providing our beautiful child models and Applied Medical for printing the Annual Report. One “fact” that is pretty much universally accepted by anyone involved in the life of a foster youth is that the holidays can be an extremely difficult time. While this is true, one doesn’t have to have the experience of foster care in order for the holidays to be a difficult time. There are a plethora of reasons that holidays may not be the most enjoyable time of the year. It may be that you or a loved one has to work; preparing for the friends and family you are hosting; remembering that you completely forgot the most wanted item on your child’s wish list; the possibilities truly are endless. For the children we serve and many other foster youth the world over there are the “typical” reasons you might not enjoy the holidays as well as all the additional reasons circumstances create. A foster child might have just lost their placement and will now be spending their Christmas at Orangewood Children and Family Center. They might be living in a group home in which their closest friends will all be gone on overnight visits leaving them feeling alone. There may be memories of wonderful or awful previous holiday experiences that keep them on edge this year. This is why amazing people like you reading this are so impactful! From the time the email is sent out in August inviting our faithful community partners to once again participate in our annual gift drive, to the day of the actual holiday party for our kiddos in December, people just like you step up and do what they can to bring joy and light to the lives of the children we serve. This support looks like companies holding general toy drives, accepting “snowflakes” containing a gift request from a child, signing up to wrap gifts, and working the holiday party. All of this support allows us to ensure each child has gifts to open this holiday season, has books to read and give as gifts, and have happy memories that we hope they will never forget. Memories like dancing the “Macarena” even though the song was out long before many of them were born, participating in a lively dance-off, and interacting with the awesome deejay that gladly played the songs requested. And that was just one aspect of the party. Kids young and “old” ( aka, on any other day they would have been too cool for this) took a trip to the North Pole for a photo op with Santa. They got to be crafty and creative with jewelry making and cookie decorating, and silly at the photo booth. And when they needed a break from all the awesomeness taking place, they went and ate a yummy lunch catered by El Pollo Loco and delicious gelato provided by Gelato Paradiso. As a CASA employee and second-year holiday party helper, I can attest to the amount of work that goes into preparing for, setting up, and cleaning up for this festive shindig. Even still, seeing the smiles, hearing the laughs, and getting to dance with these wonderful and resilient children makes it all worth it. Dancing with a Michael Jackson impersonator or witnessing the utter concentration put forth to make a bracelet fills you up with so much happiness that there’s no room to think about the clean up. So while it might take a lot of help to pull this off, with the abundant help of so many volunteers, it is something CASA OC is happy to do. Happy Holidays from our CASA family to yours! 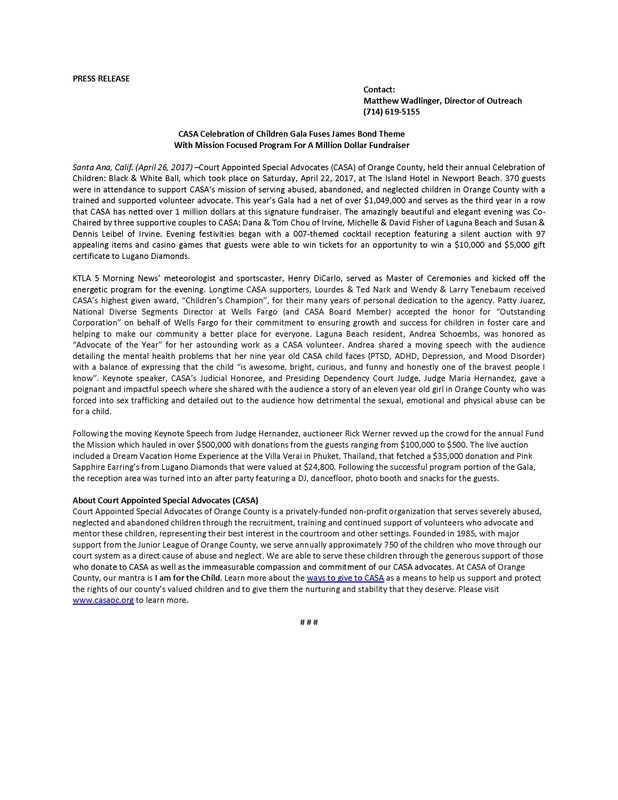 Santa Ana, Calif. (December 22, 2017) – Orange County resident, Bill Gross, and his children, have made a $2,000,000 donation to Court Appointed Special Advocates (CASA) of Orange County. Jenny Gross, a CASA Board of Directors’ member, and her husband Jeff Gross, have been offering financial and volunteer support to the nonprofit since 2012. 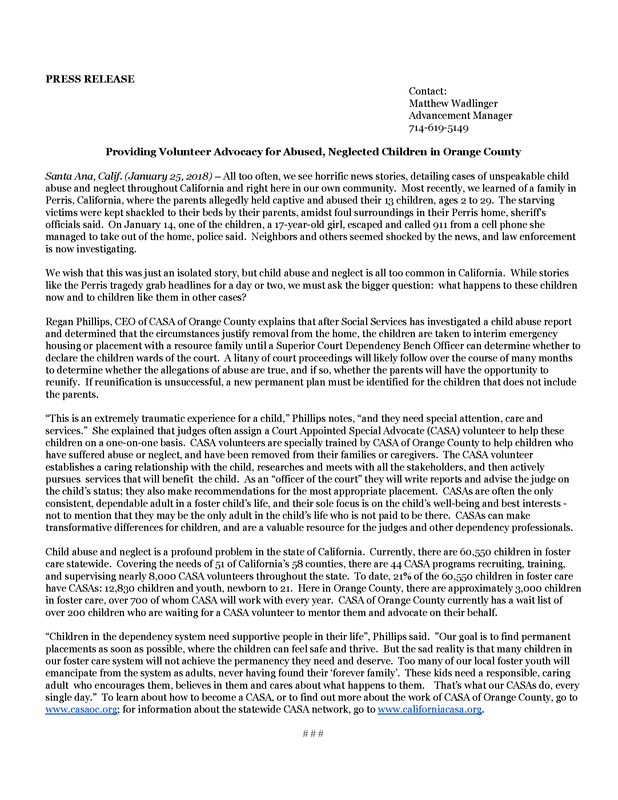 CASA of Orange County has seen referrals made by the Orange County Dependency Court Judges double since 2016, with approximately 220 children currently on a wait list, which is evidence of the effective and valuable work that these volunteers are doing on behalf of the youth. CASA served over 700 children in the foster care system last year through a unique one-on-one relationship with trained and supervised court appointed volunteer advocates. CASA works to ensure that these youth are safe, have a permanent home and an opportunity to thrive. 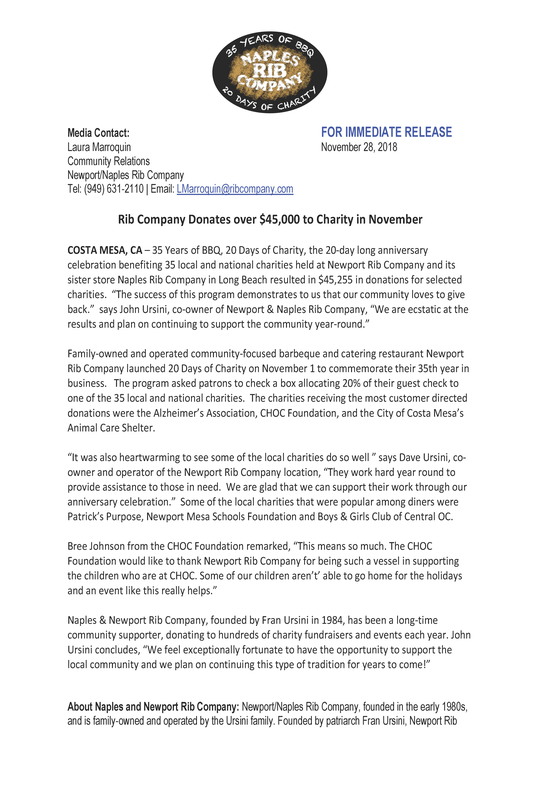 “I am still processing the news about this amazingly generous gift to CASA from Bill Gross and his children, myself, but on behalf of our entire CASA staff, I am so humbled and proud of the faith and confidence that this sizable gift communicates about our CASA mission and delivery of services to foster youth. 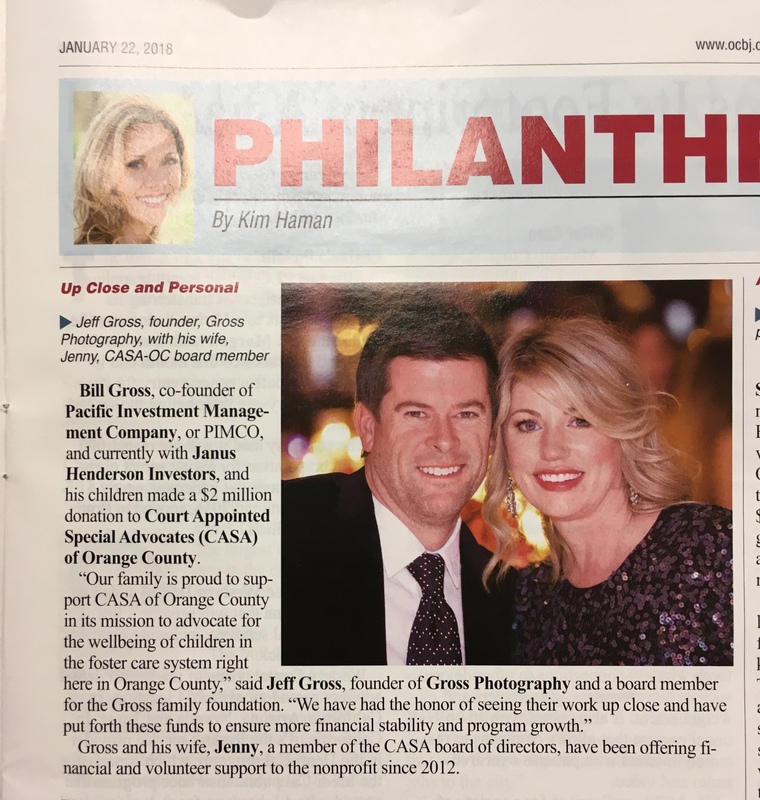 I am profoundly grateful to Jenny and Jeff Gross for their commitment and dedication to CASA and to supporting the most vulnerable youth in our community through our program's services ” said CASA-OC CEO, Regan Phillips. Court Appointed Special Advocates of Orange County is a privately-funded non-profit organization that serves severely abused, neglected and abandoned children through the recruitment, training and continued support of volunteers who advocate and mentor these children, representing their best interest in the courtroom and other settings. Founded in 1985, with major support from the Junior League of Orange County, we serve annually approximately 700 of the children who move through our court system as a direct cause of abuse and neglect. We are able to serve these children through the generous support of those who donate to CASA as well as the immeasurable compassion and commitment of our CASA advocates. At CASA of Orange County, our mantra is I am for the Child. Learn more about the ways to give to CASA as a means to help us support and protect the rights of our county’s valued children and to give them the nurturing and stability that they deserve. Please visit www.casaoc.org to learn more. Santa Ana, Calif. (November 30, 2017) –Court Appointed Special Advocates (CASA) of Orange County is pleased to announce the selection of Regan Phillips as the new CEO effective December 1st, 2017. Regan Phillips has served as the Chief Program Officer for CASA of Orange County for the last two and a half years. Prior to her role within CASA’s staff, Phillips served on the Board of Directors and assisted with fundraisers for the agency. Phillips notes that “my first contact with CASA, though, was over 15 years ago. I had obtained my undergraduate degree from the University of Southern California, and was working toward my Master’s degree in Social Work at Columbia University when I was assigned to a year-long internship at CASA in New York City. My experience with the organization led me to pursue a career in children’s rights advocacy”. Phillips attended Chapman University Fowler School of Law, during which time she worked as an investigator for the Law Office of Harold LaFlamme, a firm dedicated to representing dependent youth. Upon being sworn in as an attorney she accepted a position as minors’ counsel with the same firm, representing children in the foster care system. Phillips states that “having represented hundreds of children in the foster care system, I can state without reservation that a CASA’s involvement can be life-changing. Children—especially those in the foster care system—are often unable to identify or articulate what they need, or even what they want. Children rely on the adults in their life to pay attention, to care for them, and to ensure their needs are met. “The system” cannot replace a parent or loved one; however well-meaning and committed, the judicial officers, social workers, and attorneys working in dependency court are overburdened professionals performing a job”. Phillips long history of supporting her passion for CASA volunteers made for the logical transition from Chief Program Officer to Chief Executive Officer, “a CASA is simply a responsible, committed adult, with an open heart and an open mind; someone who spends time getting to know a youth, and who cares about what happens (or doesn’t happen) to them; someone who will speak up when someone needs to. A CASA humanizes the case for the professionals, while reinforcing to the youth that she is not invisible. Simply stated, a CASA is a hero!”. 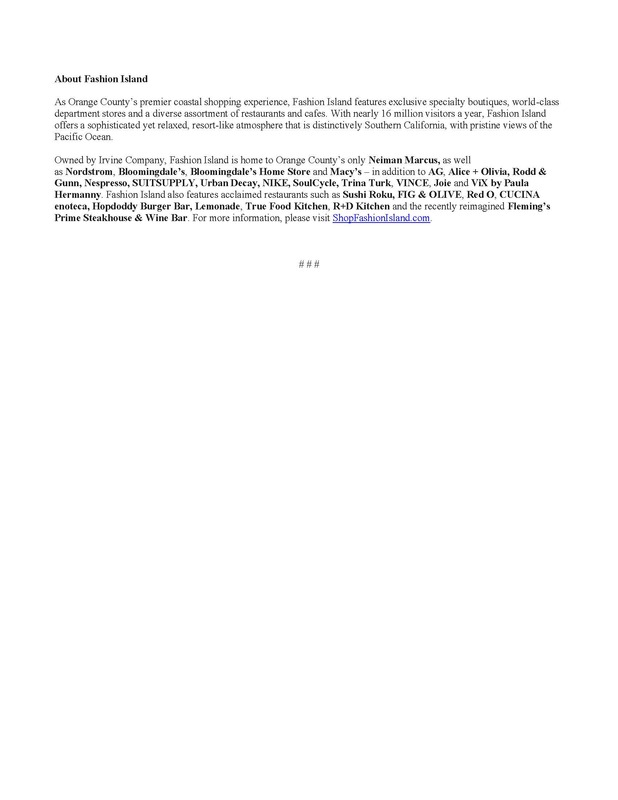 Kathryn Seebold, who has served as the CEO for CASA of Orange County since December 2014 states“I am confident that Regan will lead the organization to the next level and will do so with the intelligence, grace, elegance and wit that she has shown the past two and a half years as our Chief Program Officer”. Kathryn Seebold will be relocating to Boise, Idaho with her husband, Dan Seebold, later this year. Mrs. Seebold has been a catalyst in stabilizing the fundraising for the CASA-OC agency - since her tenure began CASA’s two biggest fundraisers, Celebration of Children Black & White Ball and the Friends of CASA Holiday Luncheon have continuously generated a larger net for the agency year after year and also assisted with crossing the threshold of becoming a 3 million dollar revenue non-profit, one of only 130 in Orange County. “With a dedicated Governing Board, committed staff and passionate volunteers we accomplished what we set out to do. We strengthened CASA as an organization internally and externally. We raised our profile within the community thanks to each and every one of you sharing your experiences with family, friends and colleagues. We raised the bar on fundraising goals and everyone came together to ensure that not only would we meet those goals, but exceed them, year after year. I’m so thankful for your commitment and support of CASA – without your dedication we could not have accomplished these goals. I will always cherish my time at CASA and the friendships I have made. Thank you for the opportunity to be a part of such a wonderful organization – it was truly an honor to serve as your CEO”. PBS SoCal recently launched To Foster Change, a public media initiative aimed at changing the realities and life outcomes for Southern California's foster youth. Using the power of public media, To Foster Change aims to tell stories that will encourage understanding, inspire hope, and spark dialog and action that will help our region's foster youth thrive. It also aims to convene with those working in the foster youth community to encourage collaboration, advance creative solutions, and reach out directly to transition-age youth to give them tools that they can use to find more success in life, school and career. 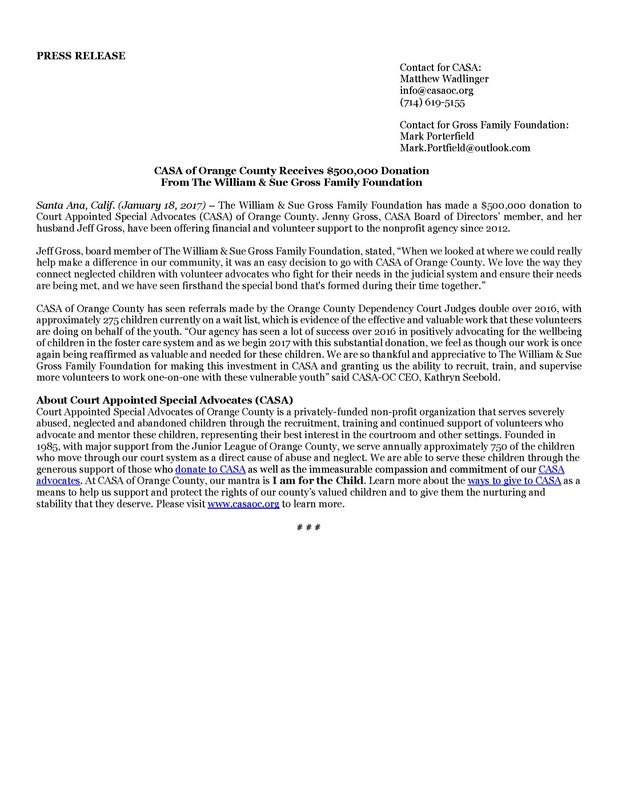 A spotlight has been completed on CASA of Orange County that features our Chief Program Officer, Regan Phillips, one of our Case Supervisors and former volunteer advocates, Nina Hamilton, and Presiding Judge Maria Hernandez. We are so proud to be a part of this wonderful initiative and we encourage you to watch this short video and share it with your networks. CASA-OC is immensely grateful to our hardworking and dedicated volunteers. We appreciate the challenges that can come with the CASA role. We want to assure you that you are valued. Our agency could not exist without you. So many acronyms it’s like alphabet soup! But you don’t give up because you know what’s at stake. No matter what comes your way your heart won’t let you retreat. CASA of Orange County is proud to showcase our recently trained and sworn-in advocates from our July 2017 Training Session. We are looking forward to getting these new CASA volunteers matched up with a child on our wait list. There are times over the course of everyone’s life when someone does something so amazing that a simple thank you does not feel like an adequate expression of gratitude. You rack your brain trying to come up with the perfect combination of words to write in your thank you note. You may wonder and worry about how you will ever be able to repay such an act of kindness. The stress of it all keeps you from remembering something you already know: repayment was not expected, nor is an elaborate or eloquent thank you required. The act of kindness bestowed upon you was simply that – an act of kindness. It was not a debt to be repaid or an expectation of gifts and grand gestures in return. CASA is fortunate to have such a person partnering with us and supporting our mission to change the lives of foster children. Sharon Engstrom is one of those individuals with a seemingly infinite capacity for giving, and a humble spirit that does not want or need recognition. Yet we want to recognize her nonetheless because this year Sharon went above and beyond for CASA and the children we serve, taking her generosity to the next level. Sharon and her husband Jay suffered the tragedy of losing their son, John Michael Engstrom, to leukemia. To honor their son’s life and legacy, they created the John Michael Engstrom Memorial Foundation to help youth. After learning about CASA from a friend who is an advocate, Sharon decided she would like CASA to be one of the John Michael Engstrom Foundation beneficiaries, thus, “John’s Fund” was formed. For several years Sharon’s generosity and John’s Fund has allowed CASA to meet the needs of hundreds of children we serve. These funds have covered a range of expenses, such as tutoring costs, laptops, and so much more. This year, in addition to John’s Fund, Sharon took on CASA’s annual Back to School Picnic! By “took on”, I mean she handled this event in its entirety. Sharon and her friends prepared, planned, and worked the picnic. 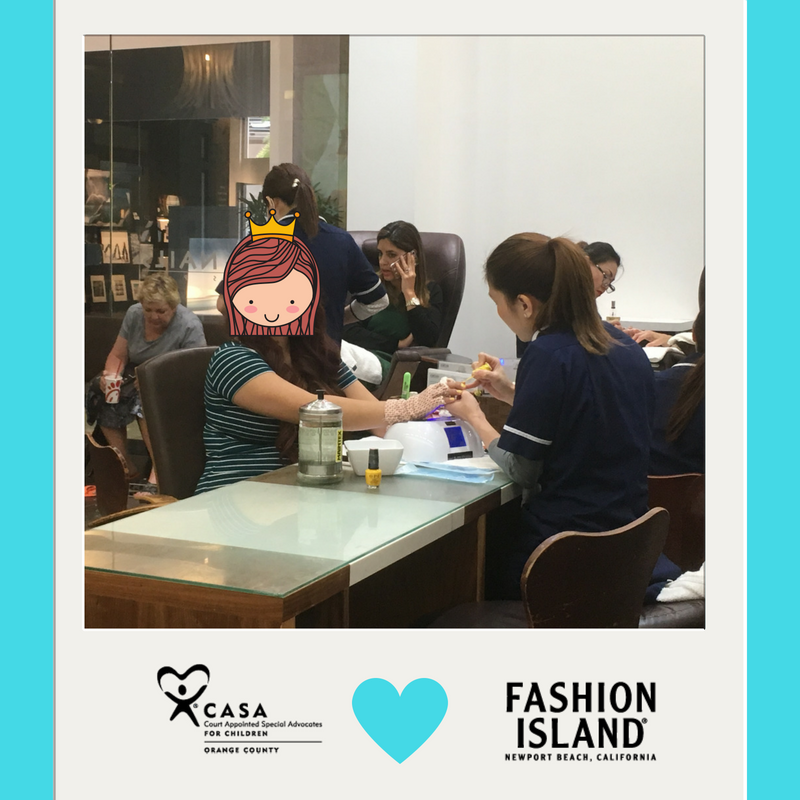 In previous years, with the much appreciated help of volunteers, CASA staff were heavily involved in preparing for and working the event. This year we served as extra support because Sharon and her friends had everything, and I mean everything, covered. They took the picnic to new heights! A picnic which was aptly named “John’s Picnic”. John’s Fund and John’s Picnic could be named virtually anything, but using John’s name is another way we honor his life. This year naming the event John’s Picnic also solved the ever-present issue of maintaining our kiddos’ confidentiality and ensuring the event was identifiable without having CASA in the name or on the signage. After I quickly realized I would be more in the way than helpful, I decided to wander around and check out all of the activities offered. There was face painting, airbrush painting, caricature artists – and that was just one small corner of the picnic! I saw boys and girls turn into Spiderman, butterflies, and grinning ear-to-ear at their cool “tattoo”. A group of boys of all ages were giving volunteers a work out as they channeled their inner Babe Ruth and hit balls so far they even surprised themselves. As someone with zero aim, I looked on with pride (and a teeny tiny bit of jealousy) as one dominated the bean bag toss, making every single one with seemingly no effort. Advocates and their kiddos laughed at each other as one or both of them struggled to keep their hula hoops up. Bubbles were blown, cookies were decorated, and art was created. In all of this fun and greatness, you wouldn’t think anything could be done to make it much better, but there was! There was live Hawaiian music and the kiddos were able to give hula dancing a shot. One little boy stole the show, and likely a few hearts, as the first brave soul to dance. Even with so many eyes on him, there wasn’t an ounce of shyness and he looked like he was having a blast. That’s still not the best part! Not only was there live Hawaiian music, there was a live performance of hula dancing. I can’t speak for everyone else, but I felt like I was on a Hawaiian vacation, enjoying a luau. And Sharon Engstrom made all of it happen. Thank you notes were written by kiddos and advocates alike. They thanked the volunteers for their time, shared how much fun they had, and for the entertainment. One of my favorite thank you notes had a donut on it (because who doesn’t love donuts!) 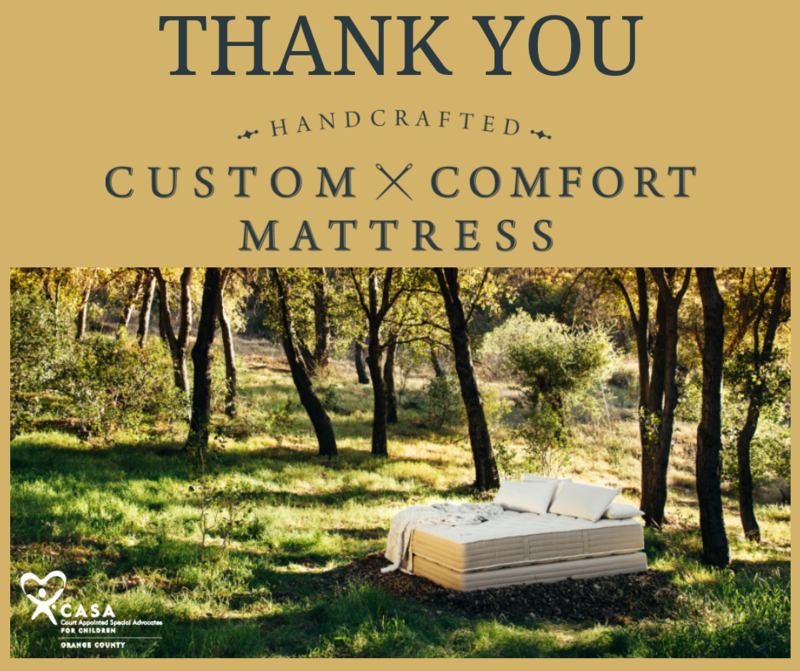 and said, “Dear CASA volunteers, thank you for being so generous, creative, and awesome!” I think that note hit the nail on the head and expressed what so many others were also thinking. One kiddo had such a good time that he expressed his thanks with four notes. From setup to cleanup, Sharon and her friends had all hands on deck. Their time and hard work didn’t just result in our kiddos having a great time. There were advocates expressing how impressed they were to one another as well as their case supervisors. All of the volunteers looked like they genuinely enjoyed being there. It was a good day for everyone all around! To top it all off, before all the CASA staff went into full panic mode wondering how we could possibly follow suit for next year’s picnic, Sharon informed us she would like to handle the event next year as well, allowing us to breathe easy while simultaneously proving her capacity for giving is seemingly infinite. John’s Fund and John’s Picnic not only honor John Michael Engstrom’s life, they touch and brighten the lives of our youth. Sharon Engstrom is truly a selfless and humble individual. CASA is honored to be in partnership with her. 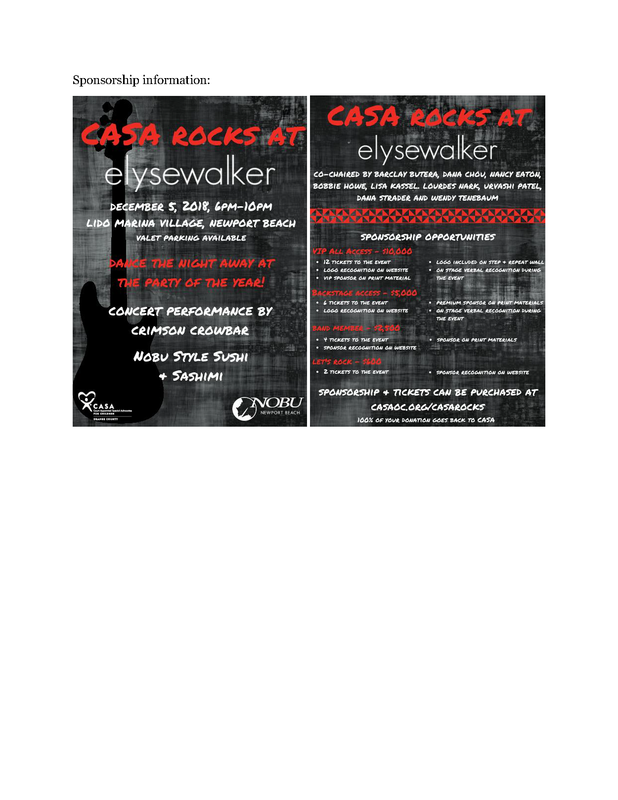 CASA is pleased to partner with Elev8 Industries to Elev8 Awareness and Elev8 our Youth! Elev8’s mission is to offer quality products that are designed to support an active lifestyle while creating awareness and support for at risk children… to change the life of a child. 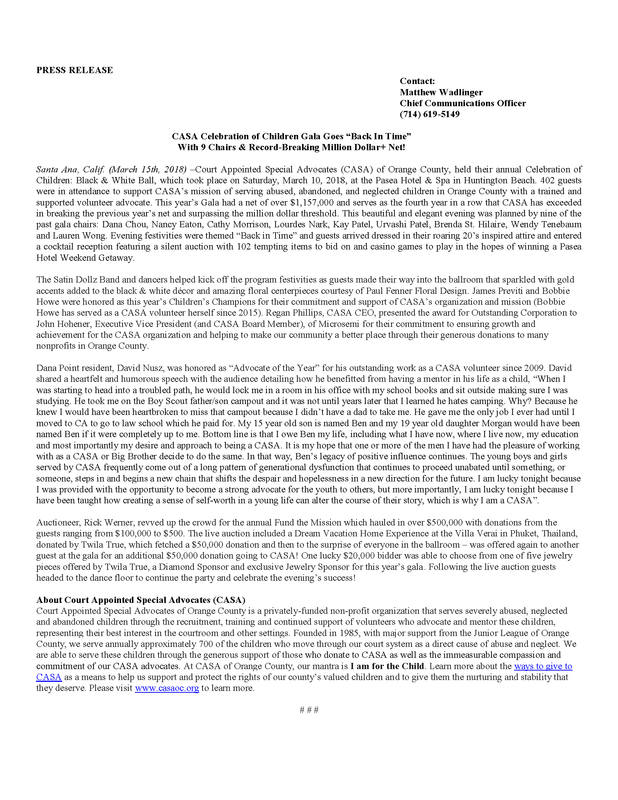 Not only will a portion of the purchase price from every single sale go to CASA upon selection, Elev8 will also hold and support events in Orange County to generate awareness, to solicit much needed funds, and to give CASA children the opportunity to experience a world of sports to which they have never been introduced. Shop the complete collection at GoElev8.com! You may have heard the buzz – or even witnessed it firsthand – about CASA OC’s Pinwheel Project. Bear with me as I talk about it yet again. For Foster Care Awareness Month, CASA OC displayed 3,000 pinwheels at Dana Point Harbor. Thanks to wonderful volunteers it looked amazing. But why would anyone donate their time, give up their Sunday to spend it hunched over, sticking pinwheels in the ground only to remove them several hours later? While I cannot speak for each volunteer individually, it’s safe to say they gave their time because this project was about more than just a pretty display of pinwheels. Those 3,000 pinwheels represented the 3,000 children in Orange County’s foster care system. Three thousand children that have endured abuse and neglect, removal from their homes, and countless other traumas in their lives. Volunteer groups from the Capital Group, PIMCO and our Kids4CASA auxiliary consisting of high school students from Corona del Mar happily assisted CASA OC in making the community aware of these often forgotten children because they wanted CASA to continue to be able to fulfill our mission of recruiting, training, and supervising community volunteers who work one-on-one with a child in the foster care system. At the time this was written 1,587 pinwheels have been sponsored, leaving 1,413 more to reach our goal of having all 3,000 sponsored. Just as we hope all 3,000 pinwheels will be sponsored, we hope the day soon comes that any of the 3,000 children that want a CASA can have one. 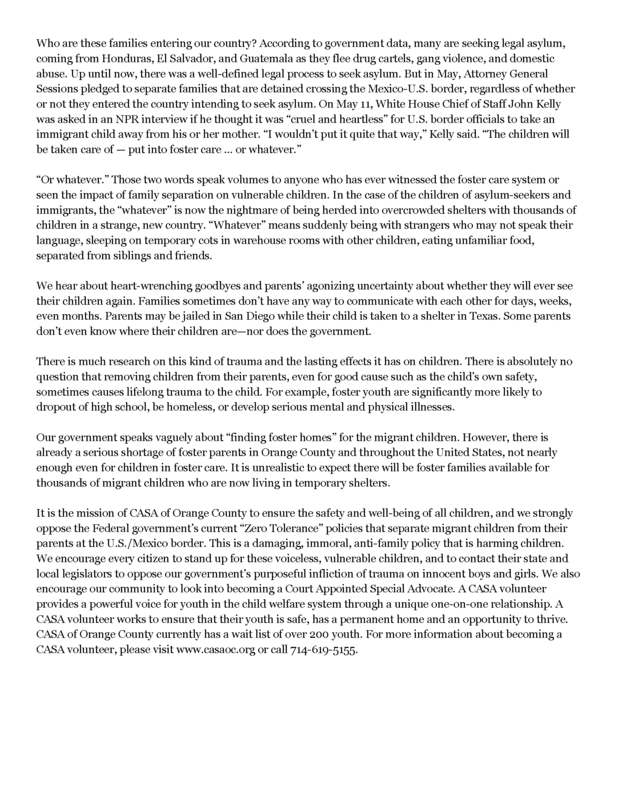 Help CASA spread awareness about the children in Orange County that we serve by sharing www.casaoc.org/pinwheel on social media platforms and sharing with friends and family. 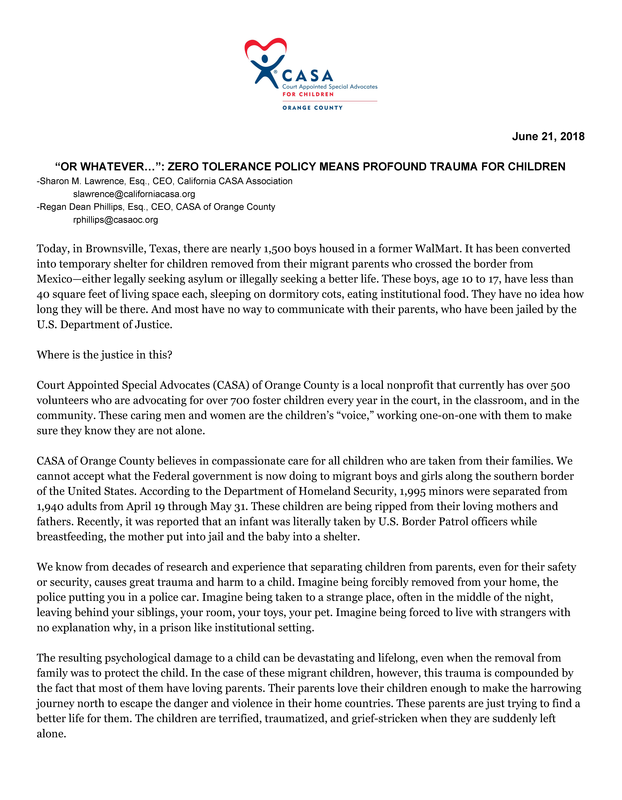 Let’s make sure Orange County does not forget about these vulnerable children! Saturday, April 22nd CASA’s annual gala took place. 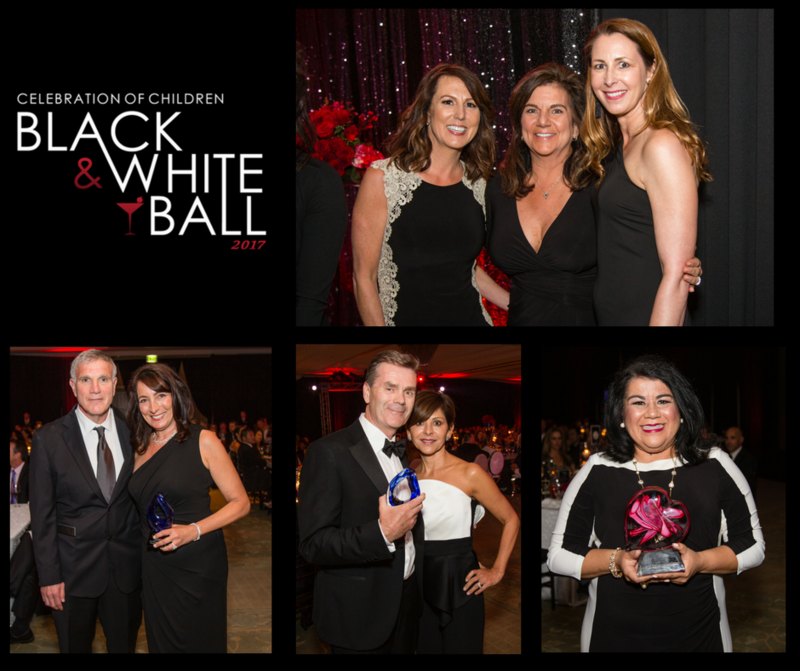 Aptly named “Celebration of Children”, the event netted over 1 million dollars for our agency. One million dollars from individuals and corporations in our community, because they believe in the value and necessity of CASA. As a CASA staff, it’s easy to speak about how amazing the agency is. After all, I come to work each day to witness colleagues put their hearts in to fulfilling our mission statement. We all come to work ready and willing to do our part. Any one of us could speak on our passion for CASA and the work we do. However, I want to share an advocate’s perspective. Who better than CASA’s “Advocate of the Year”, Andrea Schoembs? When I heard the news that I would be receiving the 2017 Advocate of the Year award from CASA I was in disbelief. I know how hard all of the CASAs work on behalf of their kiddos so it was hard for me to comprehend why I would be singled out for such an incredible recognition. I also knew the event would be an awesome experience. Little did I know it would become one of the most memorable nights of my life! It goes without saying that the recognition was amazing, but the most incredible part of the evening was witnessing the generosity of those who attended the event. Following my speech and the moving speech given by Honorable Judge Maria Hernandez was the annual “Fund the Mission”. Guests were asked to give donations ranging from $500 to $100,000. In what seemed like minutes over $500,000 was raised! The energy in the room was palpable. I have been to many fundraisers and I have never seen anything like it. The more paddles that went up to give donations, the more energized the room became. In that moment I was so proud to be a part of something that I know will benefit so many wonderful children in need. As a CASA, I’m certain that Andrea has experienced some difficulties with her case. I can imagine she has had moments she felt as though she wasn’t doing enough. She may have felt overwhelmed by the advocacy needs of her kiddo. She might have loathed the court report writing process that comes with this gig. Whatever experiences Andrea has had, she has remained committed to her kiddo. So much so that her case supervisor believed she deserved to be recognized at CASA’s biggest event. While Andrea felt proud to be part of something bigger than herself, there were most certainly people in the room who felt proud to contribute to CASA based on what Andrea shared that evening. CASA could not exist without advocates like Andrea or generous donors that raise over $500,000 in a matter of minutes. Both are needed in order to continue to serve our foster youth. Whichever category you find yourself in, please know we are infinitely thankful for you! This article originally appeared in the Orange County Bar Association's "OC Lawyer" April Magazine. Orange County Juvenile Court maintains jurisdiction over the nearly 3,000 youth who have been adjudged “dependent,” pursuant to Welfare and Institutions Code section 300. These are children who were removed from their homes for reasons relating to abuse and/or neglect resulting from a parent or guardian’s inability to adequately supervise or protect the child. The total number of affected youth are at varying stages of their dependency proceedings—some of whom may be actively reunifying with their parents while others have no involved family members, no known prospects for a permanent or “forever” family, and will likely emancipate from the system alone, and without any support, into our Orange County community. The bench officers, attorneys, and social workers working within our Juvenile Court system each oversee overwhelmingly large caseloads. Add to this fact the inherent deficiencies of a heavily bureaucratized foster care system, and the result is far too often that important, life-altering decisions are made based on insufficient information and with a lack of individualized attention to the specific needs of each youth. This often facilitates a vicious and ongoing cycle—in essence, dependency begets more dependency. These have long been the struggles for the dependency court system. In 1977, and with these firsthand observations in mind, a Seattle Juvenile Court Judge, developed a program whereby citizen volunteers could be empowered to speak up for the best interests of dependent children in the courtroom: Court Appointed Special Advocates (CASA). Ultimately, the value and utility of this program became undeniable, the role became a codified part of the dependency process, and there are now nearly 1,000 CASA programs in 49 states and the District of Columbia. CASA of Orange County, a predominantly privately funded non-profit organization, began in 1985, with tremendous support from Junior League. Since CASA OC’s origins, over 3,000 community volunteers have served over 6,000 youth within our foster care system; and the stories of change and transformation are as compelling as they are heartwarming. The primary duties of the CASA volunteer are outlined in Welfare and Institutions Code section 102, which are described as follows: (1) Provide independent, factual information to the court regarding the cases to which he or she is appointed; (2) Represent the best interests of the child involved, and consider the best interests of the family, in cases to which he or she is appointed; (3) At the request of the judge, monitor cases to which he or she has been appointed to ensure that the court’s orders have been fulfilled. A CASA volunteer need not have any legal experience or understanding of the field of social work to apply—the criterion is primarily that a prospective advocate be an adult (21+) with an open heart, an open mind, and a desire and willingness to help. To prepare volunteers for their role and interactions with some of the most vulnerable children in our community, CASA provides a comprehensive thirty-hour initial training for prospective volunteers who must also clear a background check, screening, and an interview process before they are sworn in as an officer of the court. The matching process is intended to create a CASA/youth pairing that is thoughtful and complimentary, resulting in a meaningful and consistent relationship, (many of which regularly outlast the youth’s dependency term), however CASA volunteers ultimately occupy a role that is far more comprehensive than that of a mentor or “buddy” to the youth with whom they are paired. 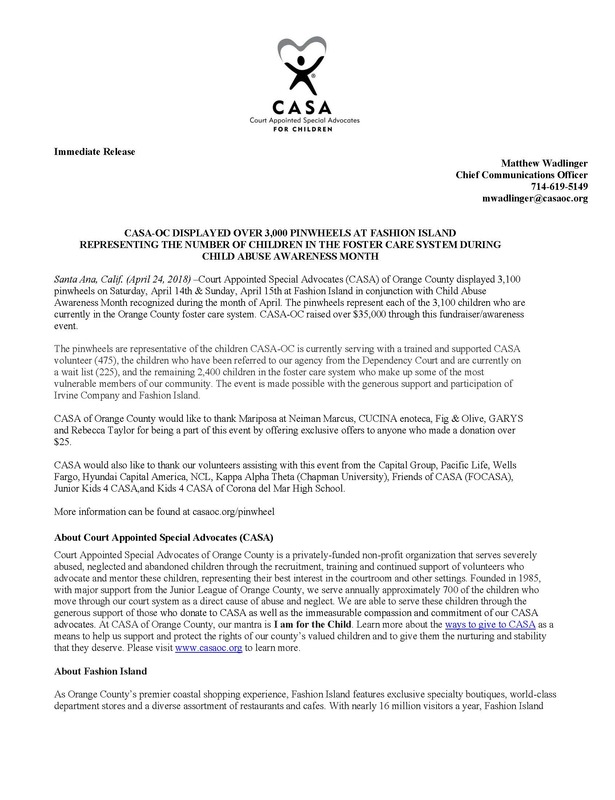 When the court makes a referral for a CASA volunteer, there is typically a specific reason or need and the advocate is entrusted with the responsibility to be an extra set of eyes and ears for the court, and to report back with relevant and helpful information at legal proceedings. The youth’s identity, circumstances, and the dependency proceedings themselves are confidential, however the appointment order confers access to this highly protected information, and further grants the CASA a voice in the outcome. The appointment order allows advocates to contact a youth’s family members, caretakers, social workers, therapists, and educators. CASA volunteers often participate in meetings that affect a youth’s placement or educational issues, and, on occasion, may be asked to hold educational rights on behalf of a youth who has no other involved person to approve educational decisions that affect the child. CASA provides regular and ongoing training opportunities for advocates so they may develop a more in-depth understanding of the unique issues they might face on a case. For these children, whose young lives have been afflicted with trauma through no fault of their own, and who are then assigned a file number becoming a “case” for a variety of paid professionals to oversee, it’s not lost on them that a CASA volunteer is making a choice: they are choosing to be there, to care, and to try to make a difference in their life. That simple fact can be the single-most motivating factor for a youth to care about their own life. It truly only takes one person whose volunteerism is a clear demonstration of concern, compassion, and commitment which has a capability to instill a level of self-confidence and self-awareness that can turn this dependency cycle around. Since the holiday months, there has been a steady stream of advocates and their CASA youth cooking in CASA’s kitchen. This has been a particularly pleasant experience for the case supervisors as the hunger inducing aromas waft down the hall. It’s safe to say the smell of cookies, cupcakes, and other sweet treats is an office favorite. Even better than the yummy aromas is witnessing these youth in the kitchen.For many, this is the first time that they’ve cooked or baked regardless of age. Depending on when you peek your head in, you’ll find the youth looking fiercely determined to carry out their advocate’s instructions, or laughing and smiling as they decorate their treats or joke about mistakes made. You’ll find the advocate patiently explaining things and praising their youth for their effort and skills. These moments are greatly appreciated because as case supervisors, the opportunities to see our advocates with their youth are few and far between. Whether the relationship is a new one or the advocate has been on the case for several years, there’s an unmistakable joy to be together. As if that isn’t heart-melting enough, seeing a youth’s pride in themselves when they get something right. During one of these kitchen sessions in which at least 2 dozen cookies were being baked and decorated, our Chief Program Officer, Regan Phillips popped her head in to say hello. I happened to be walking to the kitchen to check in on my advocate and youth when I overheard the best thing I’d heard all day. Claire*, my advocate had just finished explaining to Regan that this was 7-year- old Liz’s* first time baking. Regan complimented Liz on how well she was doing, saying, “Wow. Well you must be a fast learner if this is your first time!” To which Liz replied, “I am a fast learner because I’m really smart!” Claire, Regan, and myself could only agree with that declaration. To see Liz’s excitement in baking and decorating, was great a pleasure all on its own. But to hear Liz confidently exclaim her smarts took the cake (pun intended)! In the CASA kitchen, it seems everything else falls away. Here, they are determined, happy, and undoubtedly getting amped up on the sugary decorations they think they are sneaking. These kiddos likely face daily reminders of the fact that they are foster youth, whether it be classmates wondering why different people pick them up from school on different days, or at a doctor appointment where a staff person is writing their job title next to their signature when signing documents. One could say even being in the CASA kitchen is a reminder, and they would be right. Yet for some reason, these visits are full of nothing but joy. And though the aromas eventually fade, in what seems to be a new unspoken rule, advocates and their youth leave lovely thank yous on our whiteboard. Thus far, there hasn’t been a single time that the finished result wasn’t eagerly offered to be shared. And who can turn away a child offering up cupcakes and cookies with at least 7 times the daily recommendation of sugar? I know I couldn’t! I can confidently say that our entire office enjoys our visiting sous chefs and advocates and returns are always encouraged. If you’d like to reserve CASA’s kitchen please contact your case supervisor. We’ll see you soon! 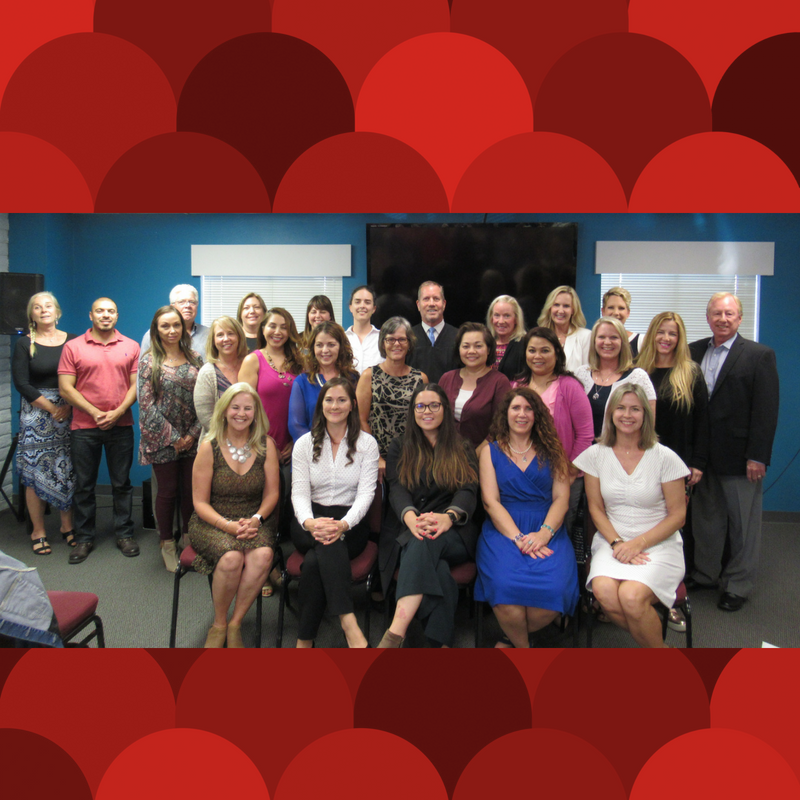 CASA of Orange County is thrilled to show off the graduates from our January Training Session. Twelve of our new fifteen CASA volunteers were sworn-in by Judge Maria Hernandez last week at our offices in Santa Ana. We are looking forward to matching up these new CASA advocates with children on our wait list. Congratulations to all! Congratulations to our 30 new advocates who were sworn-in last week by Judge Moorhead! We are excited to get all of these amazing new volunteers matched up with some of the 280+ kids that are currently on our wait list. Congratulations to you all and we are looking forward to seeing you all begin your journey of being matched with a child in our program! Friends of CASA Set Record-Breaking Net at Annual Holiday Luncheon & Fashion Show Supporting CASA of Orange County! Santa Ana, Calif. (December 14, 2016) – Friends of CASA, a fundraising auxiliary of Court Appointed Special Advocates (CASA), hosted its 2016 Holiday Luncheon on Wednesday, December 7, 2016, at The Monarch Beach Resort in Dana Point. The Luncheon and Fashion Show proved a hard ticket to come by as the event was sold out prior to invitations even hitting mailboxes. This year’s event netted more than $344,000 that will go directly to supporting CASA’s mission of recruiting, training, and supervising community volunteers who mentor and advocate for children in the foster care system. 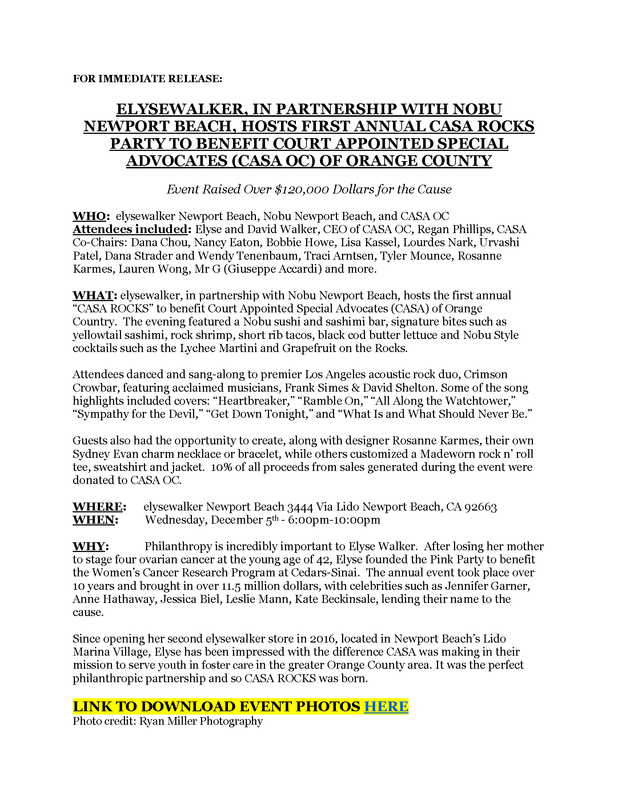 Top Tier Diamond Starfish Sponsors of this event included Barclay Butera Interiors and Lugano Diamonds. 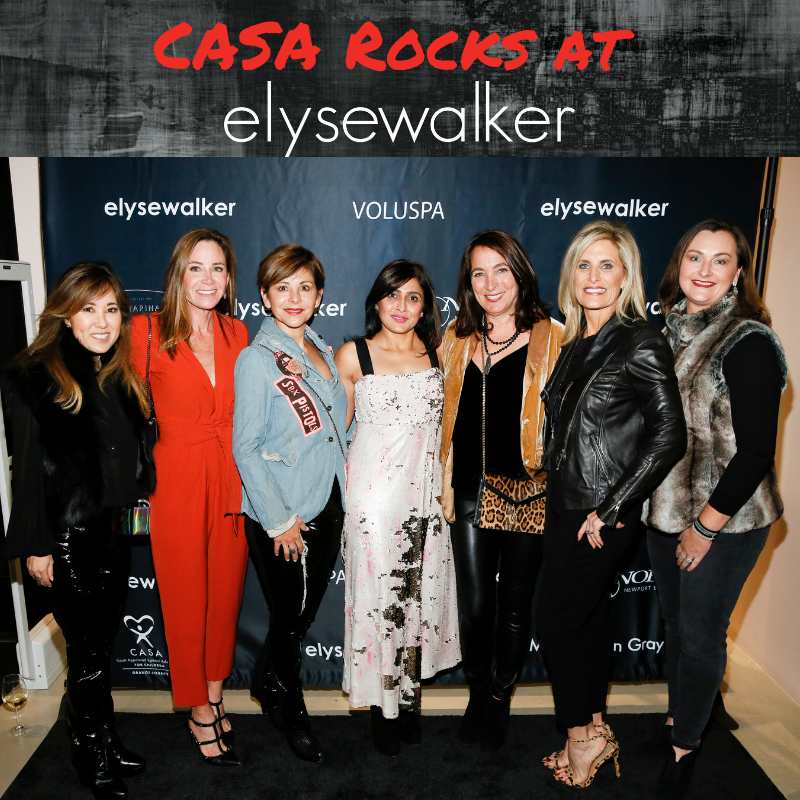 The sophisticated yet modern event was co-chaired by Molly Jolly and Kimberly DeLamar Matties, who were assisted by a team of over 60 members from the Friends of CASA auxiliary group, which is led by Interim President and CASA CEO, Kathryn Seebold. 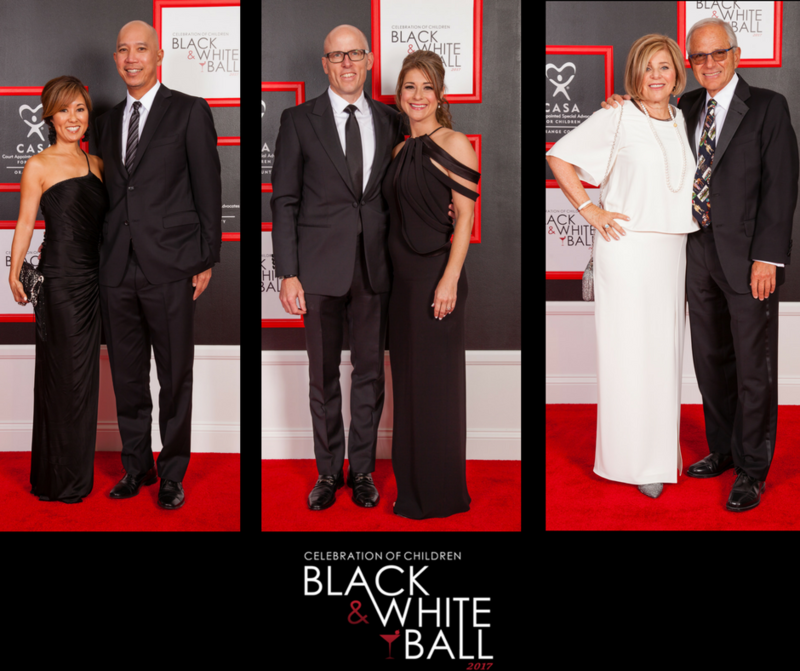 This year’s event also had two Masters of Ceremonies, Barclay Butera and Ray Langhammer of Barclay Butera Interiors, who brought their unwavering passion of helping CASA forward throughout the event. Over 600 guests filled the halls outside of the ballroom to bid on 166 auction packages during the champagne reception. The 2016 Fashion Partner, Ted Baker London, presented by South Coast Plaza featured both women and men’s fashions. The runway show brought forth an irreverent sense of humor and unswerving attention to detail through the British brand’s known unconventional approach to fashion. The guest speaker for the event was current CASA volunteer, Rhonda Beylik. Rhonda shared her story of coming to CASA four years ago and being matched with “a beautiful, petite, brown eyed, dimpled 14 year-old girl”. One of Rhonda’s first assignments as a CASA volunteer was to ask this young girl what she would like as a “Starfish Wish” – which are special gift items that guests of the Holiday Luncheon are able to pick off of the Starfish Trees and purchase for the kids that CASA services. Rhonda’s child asked for a camera one year, so that she could make memories, an opportunity to go YMCA Camp Fox in Catalina another year after years of being afraid of telling her peers what she did over the summer – as she never had opportunities to do anything fun or exciting, and this past year told her CASA that she had everything she needed – and didn’t have a wish “Have you ever in your life, ever heard a teenager say those words?”, Rhonda asked the crowd. Rhonda ended her story by sharing the good news that her CASA child is the first person in her family to graduate from high school and also attend college – a true success story with the help of her CASA volunteer. 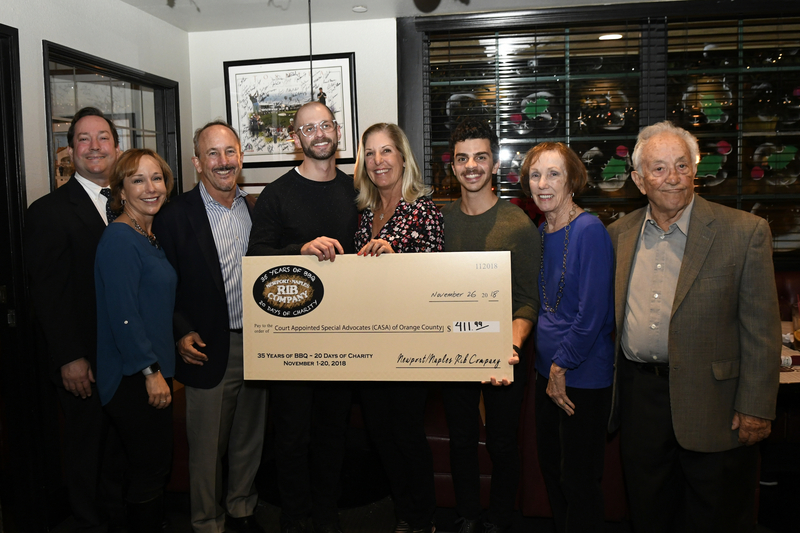 An opportunity drawing donated by Lugano Diamonds featured a 5.49 Pear Shape Black Diamond pendant with .75cts Round Brilliant Collection VS Diamonds and an additional 5cts Black Diamonds set in 18k White Gold and valued at $25,000 was won by Tyler Matthew Olbres. 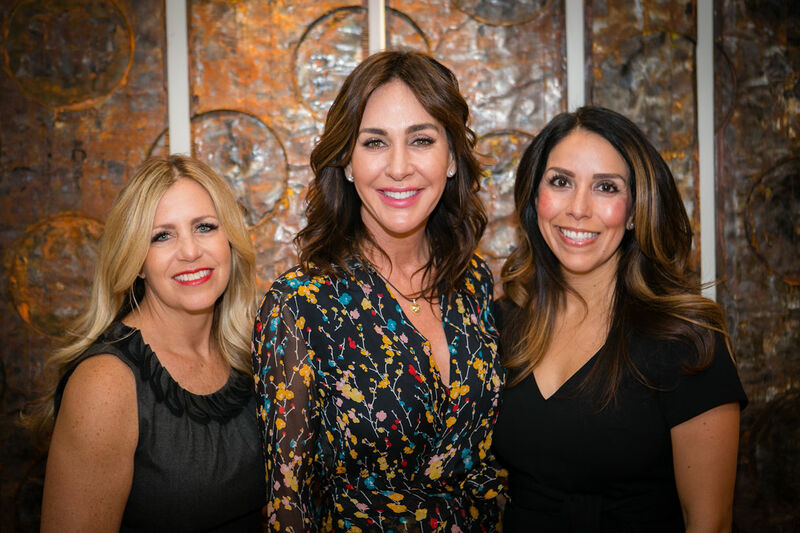 Friends of CASA are committed to raising funds for CASA of Orange County’s mentor-advocate program for abused and neglected children in the foster care system. Through the annual Holiday Luncheon, the Friends of CASA raise awareness of the CASA program, recruiting volunteers and long-term donors to CASA. Over the years, this dedicated group of women has been responsible for raising well over 2 million dollars that has gone directly to addressing the needs of some of our community’s most vulnerable children. This year’s Executive Committee of the Holiday Luncheon consisted of Stacie Capobianco, Elizabeth Carpino, Tiffanie Foster, Sandra Gee, Annette Helmich, Shawni Jackson, Lori Jackson, Patty Juarez, Sandi Marino, Colleen Masterson, Stefanie Stamires, Janine Wald, Jaynine Warner, Tracy Wiegand, Kristen Wilson and Marjie Zethraus. Court Appointed Special Advocates of Orange County is a privately-funded non-profit organization that serves severely abused, neglected and abandoned children through the recruitment, training and continued support of volunteers who advocate and mentor these children, representing their best interest in the courtroom and other settings. Founded in 1985, with major support from the Junior League of Orange County, we serve annually approximately 750 of the children who move through our court system as a direct cause of abuse and neglect. We are able to serve these children through the generous support of those who donate to CASA as well as the immeasurable compassion and commitment of our CASA advocates. At CASA of Orange County, our mantra is I am for the Child. Learn more about the ways to give to CASA as a means to help us support and protect the rights of our county’s valued children and to give them the nurturing and stability that they deserve. Please visit www.casaoc.org to learn more. Listen in to the podcast of The Financial Wake Up Show from this past weekend to hear from our very own Chief Program Officer, Regan Phillips! Thank you to Daniel Choi and the team at KCAA 1050 AM and 106.5 FM for the spotlight! 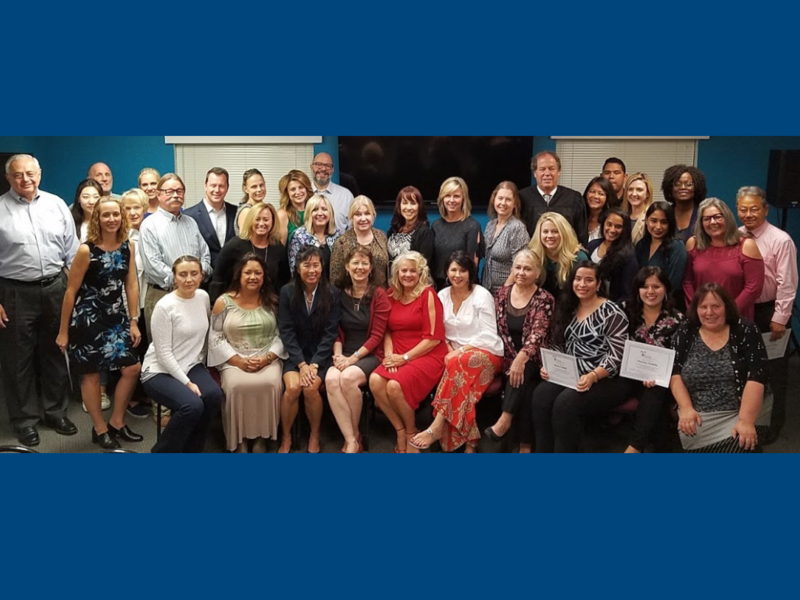 CASA of Orange County is proud to show off 14 of our new 15 advocates who were sworn-in last week by Judge Arthur from our September Training Session. We look forward to seeing you all as you begin your journey of advocating and mentoring a child in the foster care system! Congratulations on your achievement! Festival of Children Foundation is kicking off their 15th annual celebration at South Coast Plaza and CASA-OC is so excited to be part of it again. Check out the link below to a great article from the LA Times that details some of the exciting things planned this year. Congratulations to our July 2016 Training Class which brought 27 newly sworn-in CASA's to our agency. We are so excited to have all these amazing volunteers joining our team to help children in the foster care system! CASA of Orange County - Court Appointed Special Advocates is so excited for our new partnership with Goodwill of Orange County! Do you have stuff around your house that you aren't using anymore and have been meaning to donate? Now is the time! Please drop off your items to the Goodwill location at 1800 North Grand in Santa Ana, and let them know that you were referred by Court Appointed Special Advocates. 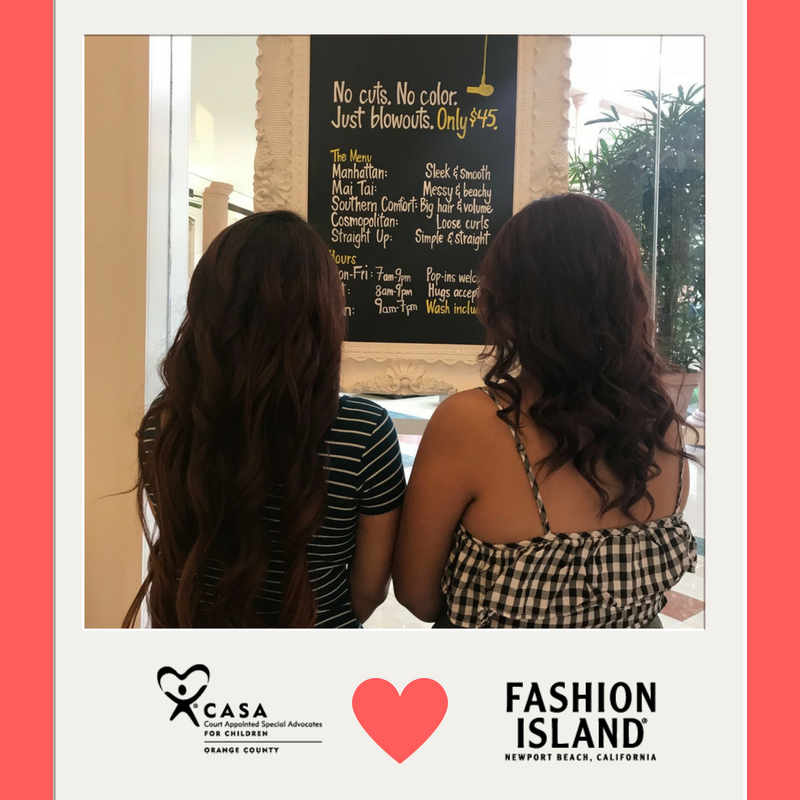 CASA will receive credit for your donated items that we will be able to give back to our older CASA youth in the form of gift vouchers to go shopping and purchase stuff of their own. Your donated gift items will essentially go twice as far in helping others! Court Appointed Special Advocates netted over $25,000 at the Second Annual CASA Cup fundraiser. Seventeen teams of 10 dressed in lavish costumes boarded decorated Duffy boats and headed into the Newport Peninsula on a scavenger hunt that included stops at Pizza Nova, where teams had to order a special drink to get a point and also to the Balboa Bay Club where teams had to build a sand castle. Trivia questions regarding the non-profit and Newport Peninsula were also part of the fun scavenger hunt. 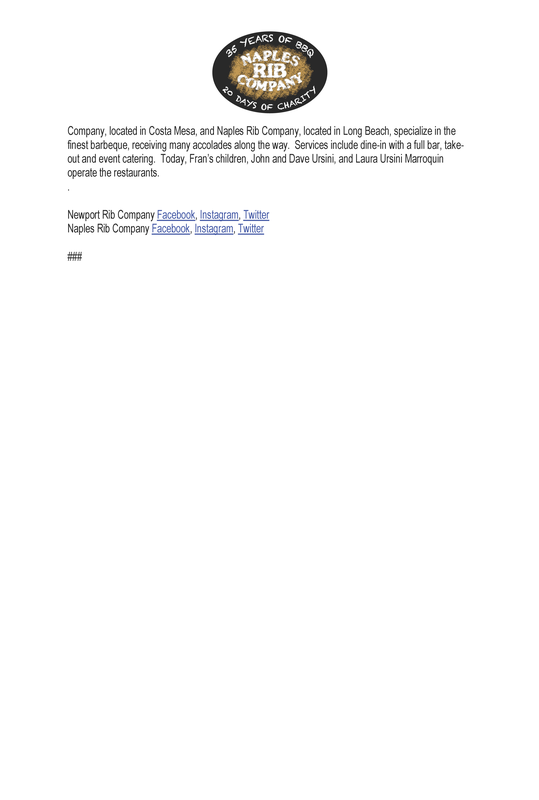 Following the scavenger hunt, over 160 guests were invited to a barbecue at the Balboa Bay Club in Newport Beach, that featured summer staples like hamburgers, hot dogs, and cold beer. CASA-OC CEO, Kathryn Seebold took the stage to announce the winner of the CASA Cup and also the team with Most Spirit, IdeaHall, led by Rebecca and Randy Hall. Court Appointed Special Advocates of Orange County is a privately-funded non-profit organization that serves severely abused, neglected and abandoned children through the recruitment, training and continued support of volunteers who advocate and mentor these children, representing their best interest in the courtroom and other settings. Founded in 1985, with major support from the Junior League of Orange County, we serve annually approximately 1,000 of the children who move through our court system as a direct cause of abuse and neglect. We are able to serve these children through the generous support of those who donate to CASA as well as the immeasurable compassion and commitment of our CASA advocates. At CASA of Orange County, our mantra is I am for the Child. Learn more about the ways to give to CASA as a means to help us support and protect the rights of our county’s valued children and to give them the nurturing and stability that they deserve. Please visit www.casaoc.org to learn more.